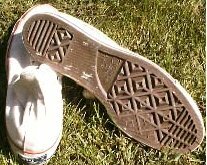 Photo gallery of optical white high tops, a core color. 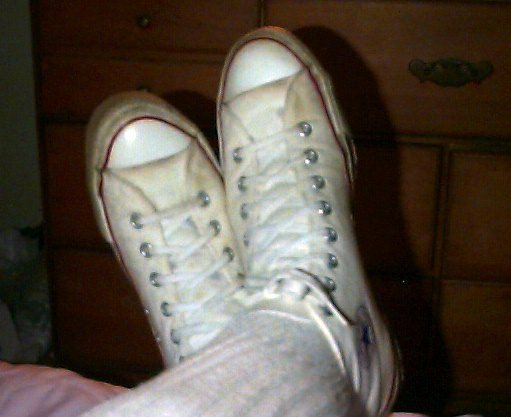 1 Optical White High Top Chucks Top view of a new pair of vintage monochrome white high top chucks. 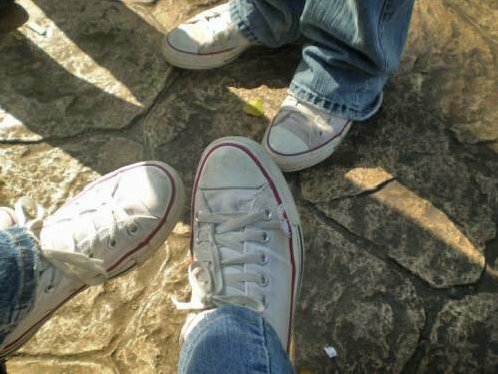 2 Optical White High Top Chucks Optical white and natural white high tops side by side. 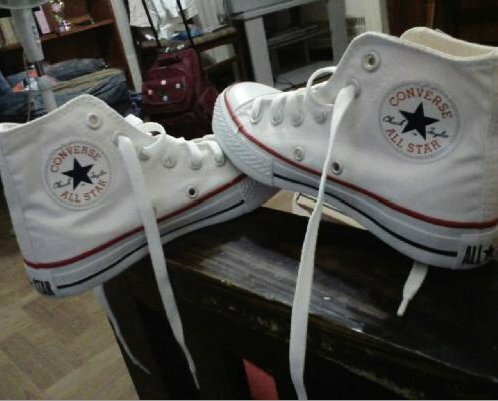 3 Optical White High Top Chucks Brand new left optical white chuck with tag. 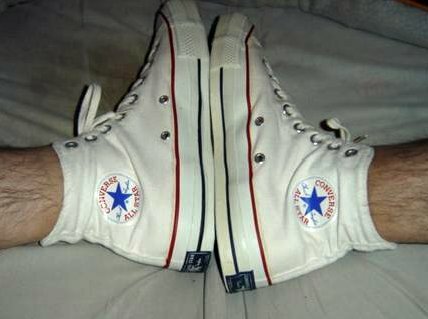 4 Optical White High Top Chucks Angled inside path view of a left optical white high top chuck. 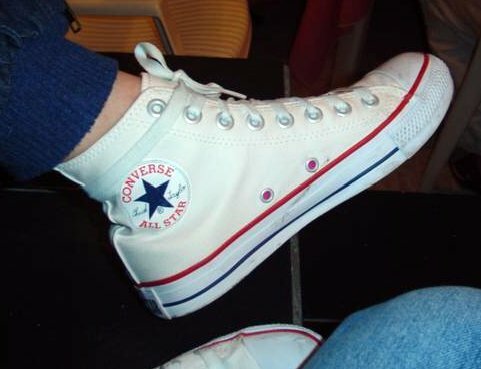 6 Optical White High Top Chucks New optical white high top chucks. 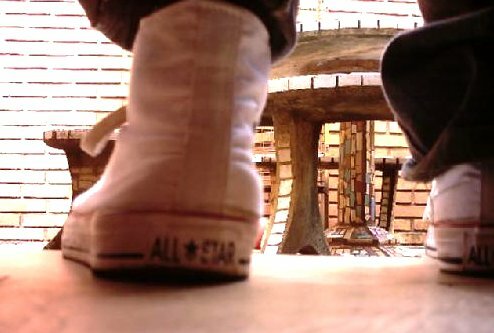 7 Optical White High Top Chucks Outside view of a left optical white high top. 8 Optical White High Top Chucks Inside patch view of a left optical white high top. 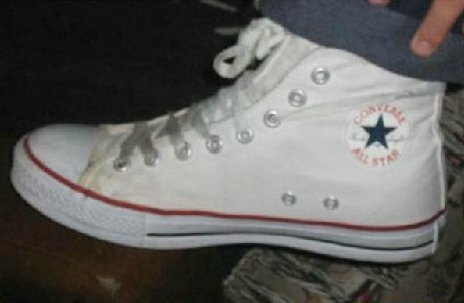 9 Optical White High Top Chucks Inside patch view of a right optical white high top. 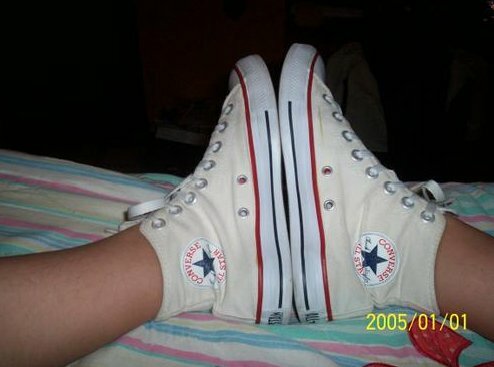 10 Optical White High Top Chucks Outside view of a right optical white high top. 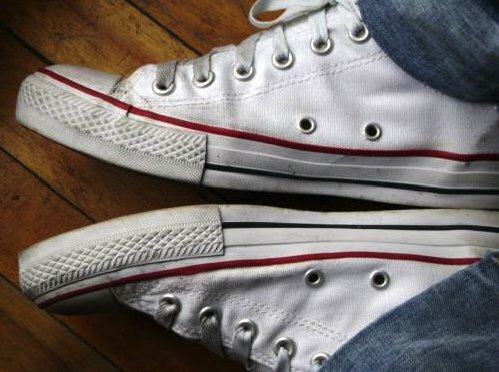 11 Optical White High Top Chucks Top view of optical white high tops. 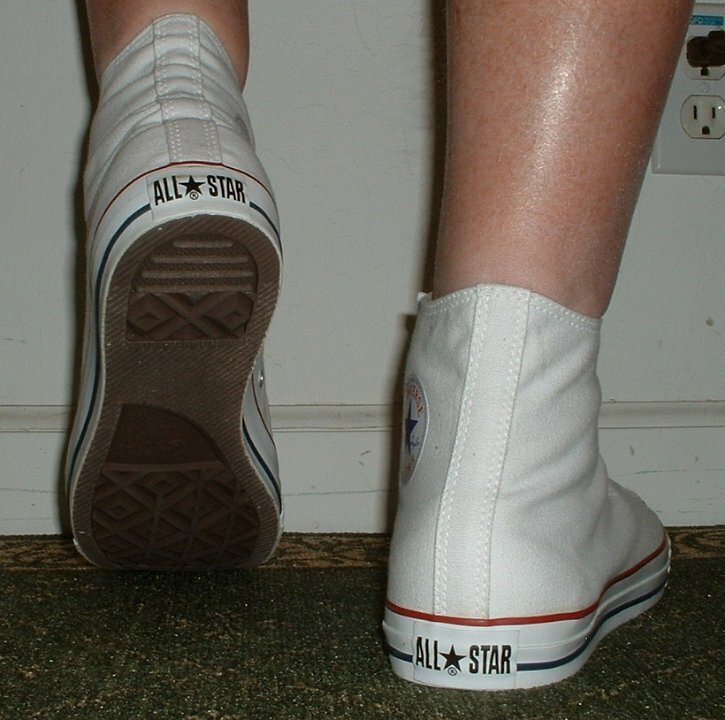 12 Optical White High Top Chucks Rear view of optical white high tops. 13 Optical White High Top Chucks Front view of optical white high tops. 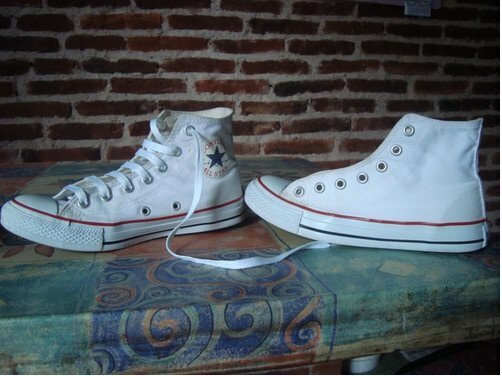 14 Optical White High Top Chucks Front and top view of a pair of optical white high tops. 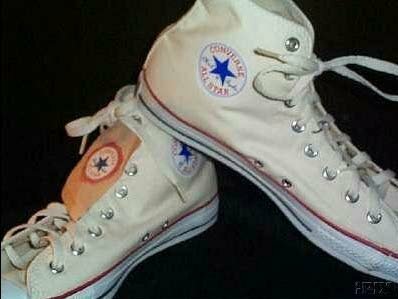 15 Optical White High Top Chucks Inside patch views of optical white high top chucks. 16 Optical White High Top Chucks Angled front view of optical white high tops. 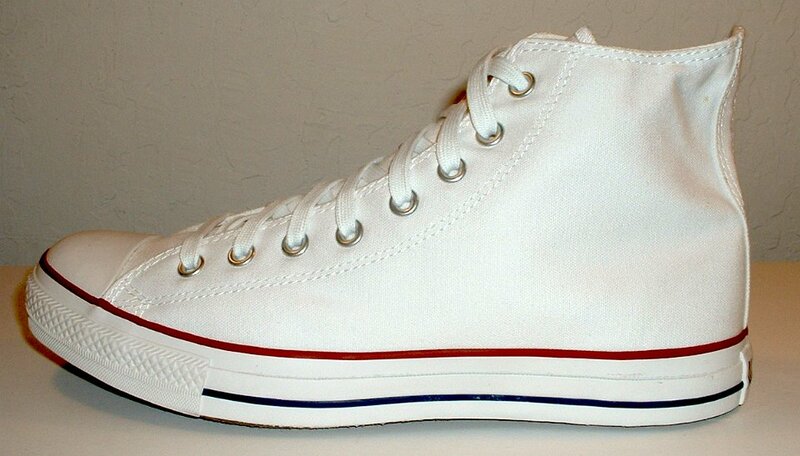 17 Optical White High Top Chucks Angled side view of optical white high tops. 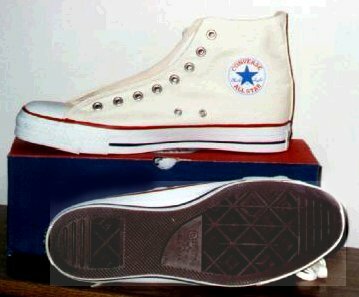 18 Optical White High Top Chucks Inside patch and sole view of optical white high tops. 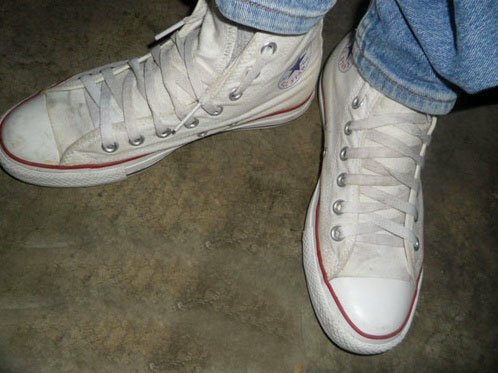 19 Optical White High Top Chucks Inside patch view of a left worn and dirty optical white high top. 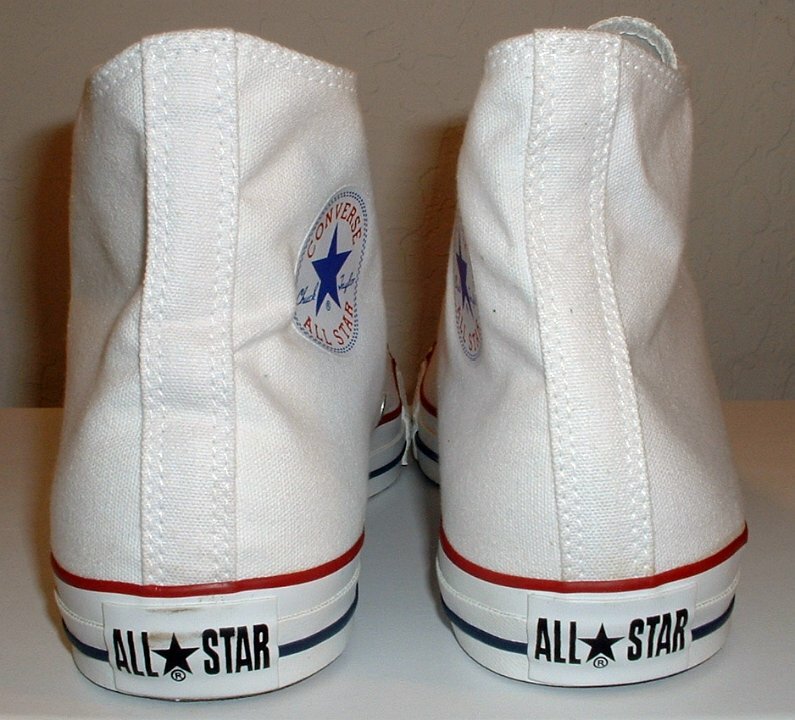 20 Optical White High Top Chucks Catalog view of a right optical white high top, angled inside patch view. 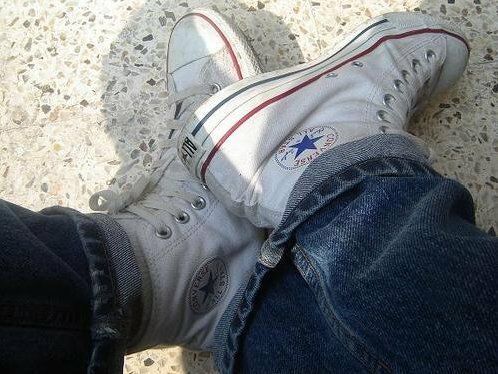 21 Optical White High Top Chucks Left optical white high top, inside patch view over blue jeans. 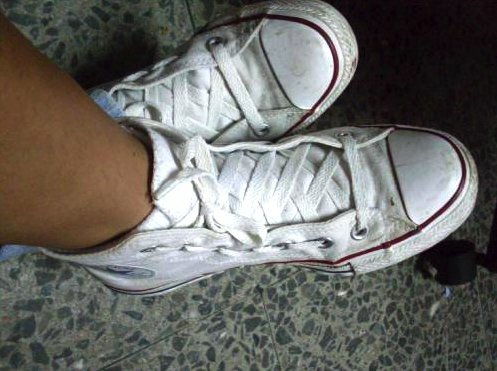 22 Optical White High Top Chucks Inside patch view of a dirty and worn right optical white high top. 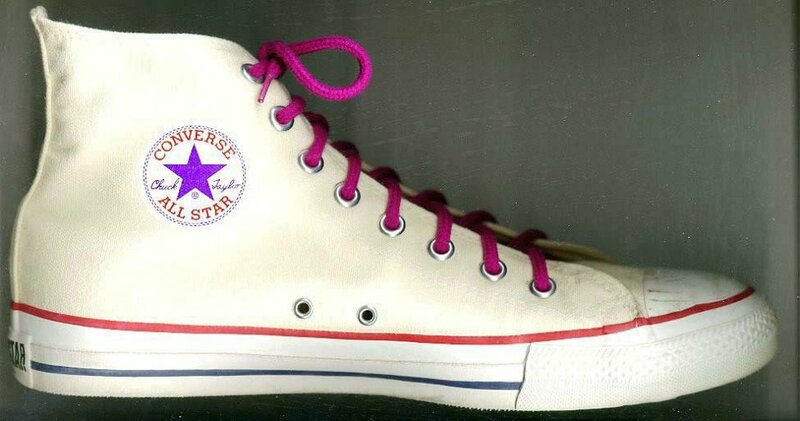 23 Optical White High Top Chucks Left optical white high top with narrow magenta laces, inside patch view. 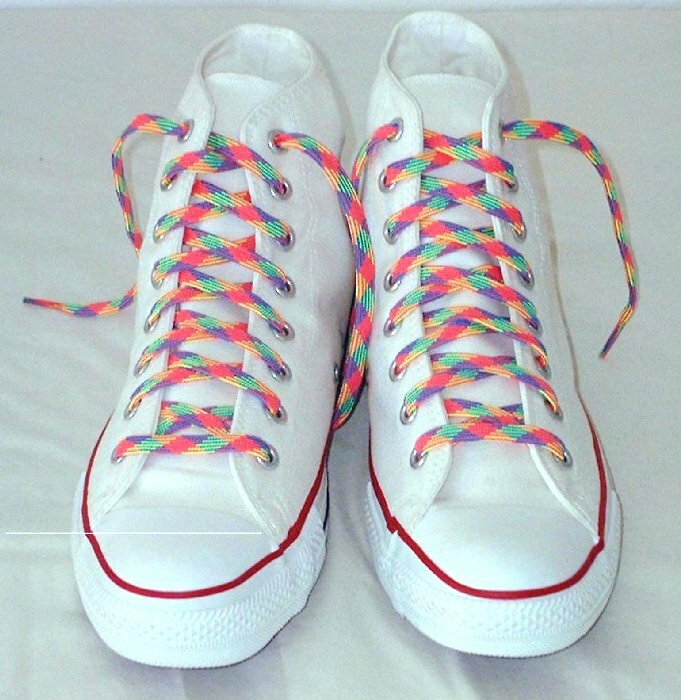 24 Optical White High Top Chucks Front and top view of optical white high tops with rainbow laces. 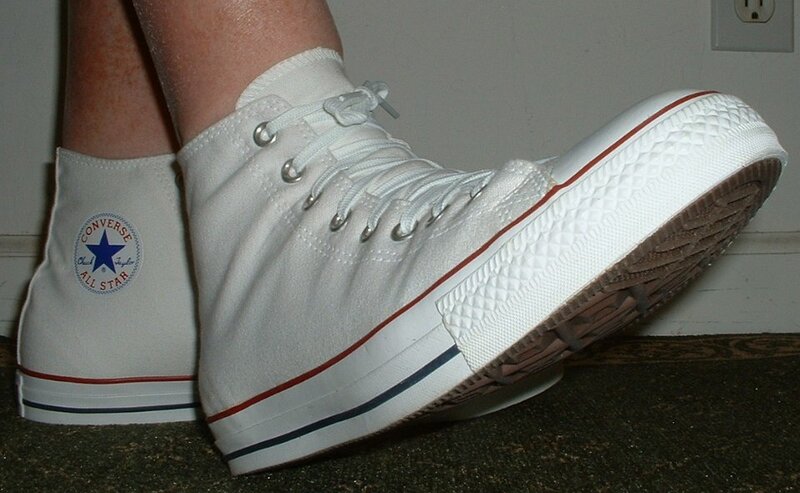 25 Optical White High Top Chucks Catalog shot of a left optical white high top, inside patch view. 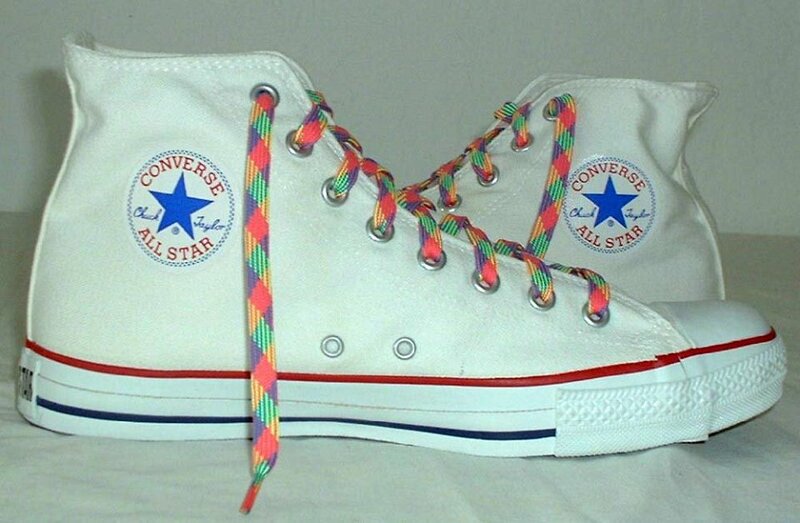 26 Optical White High Top Chucks Angled front view of optical white high tops with rainbow laces. 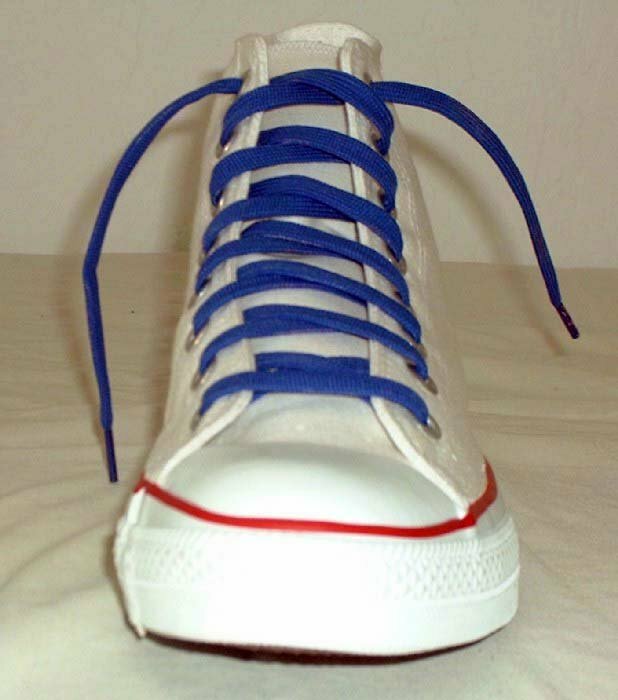 27 Optical White High Top Chucks Top view of a right optical white high top with narrow navy blue laces. 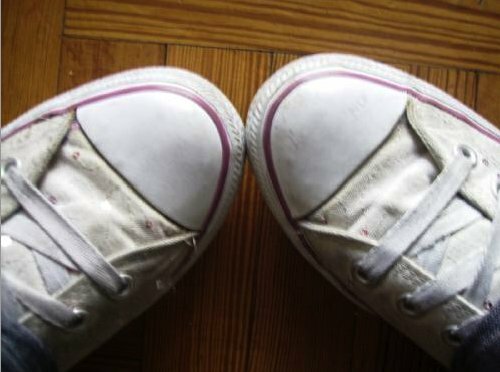 28 Optical White High Top Chucks Inside patch view of a worn left optical white high top. 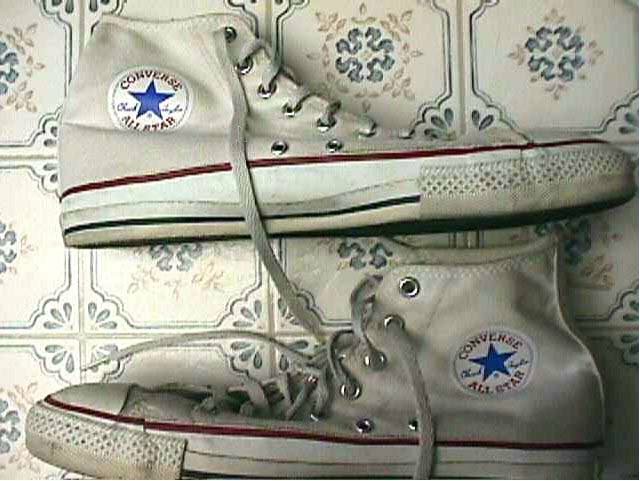 29 Optical White High Top Chucks View of a vintage heel patch on an optical white high top. 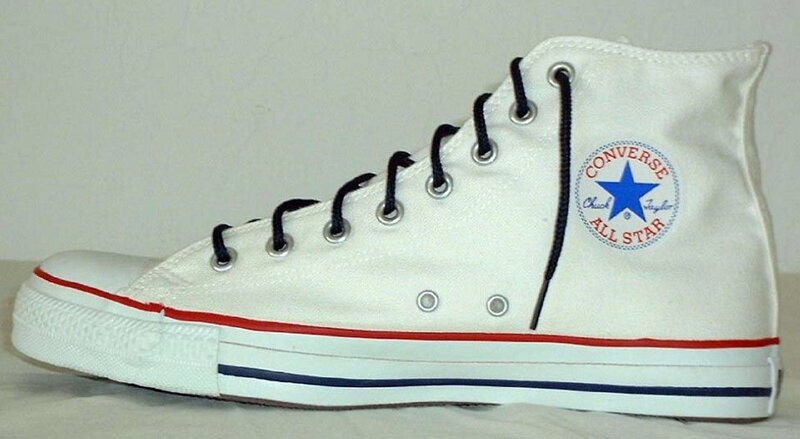 30 Optical White High Top Chucks Optical white high tops, outside view. 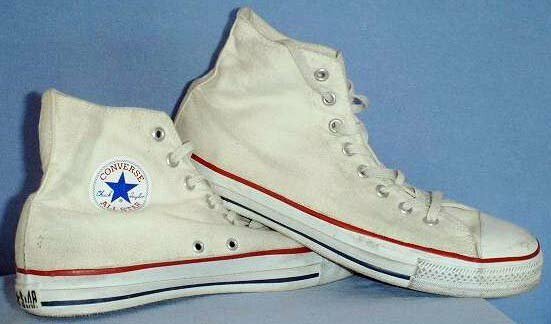 31 Optical White High Top Chucks Vintage optical white high tops, rear and sole views. 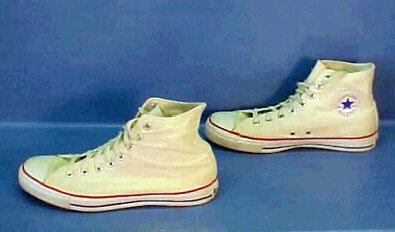 32 Optical White High Top Chucks Vintage optical white high tops, rear view. 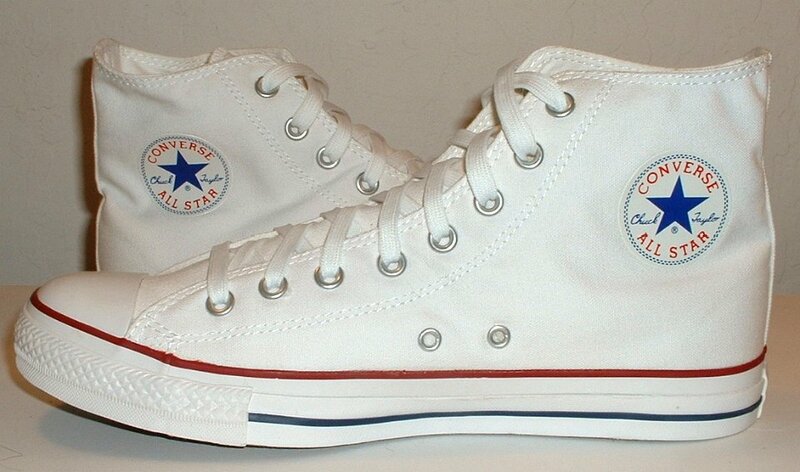 33 Optical White High Top Chucks Vintage optical white high tops, showing the players name area inside the tongue. 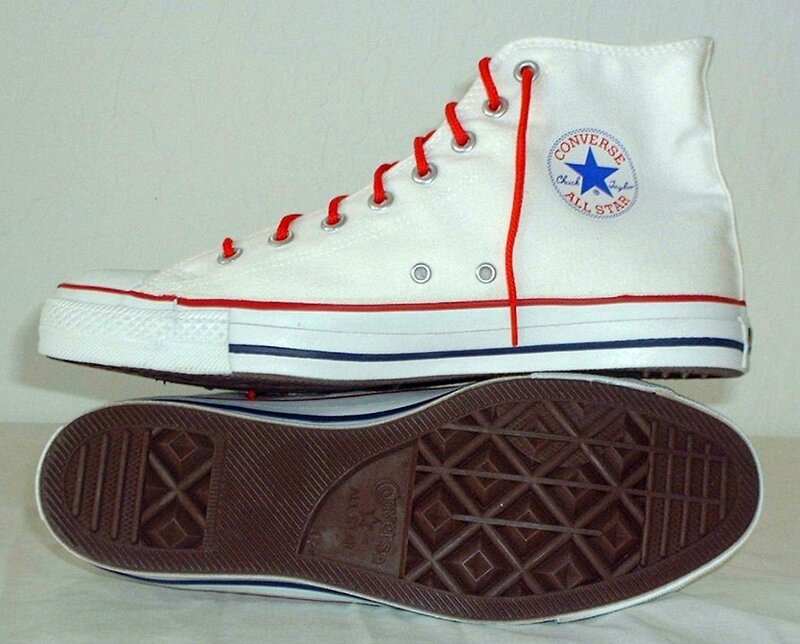 34 Optical White High Top Chucks Inside patch and sole views of optical white high tops with narrow red laces. 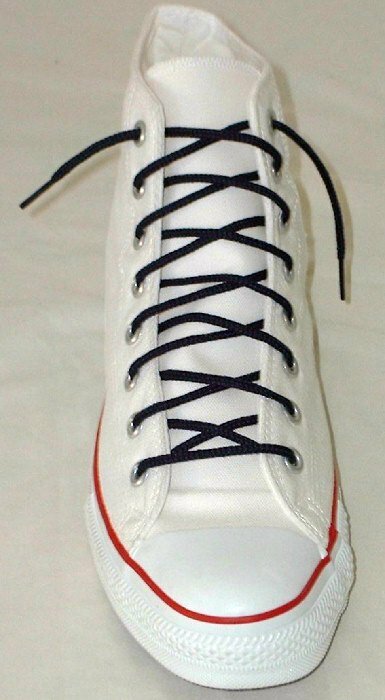 35 Optical White High Top Chucks Inside patch view of a right optical white high top with narrow navy blue laces. 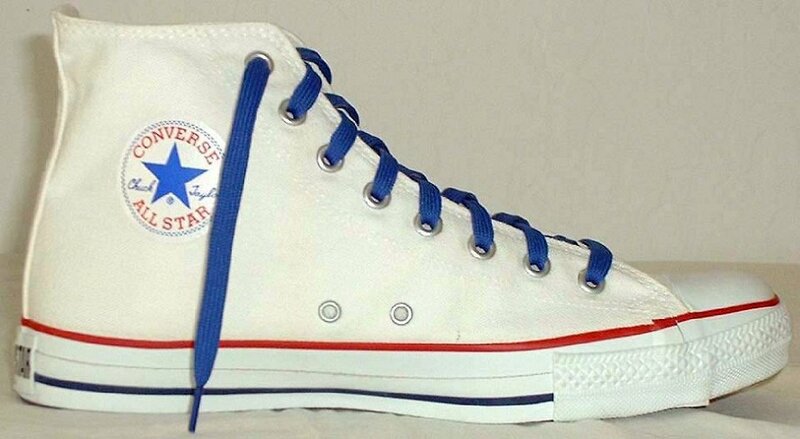 36 Optical White High Top Chucks Front view of a left optical white high top with royal blue laces. 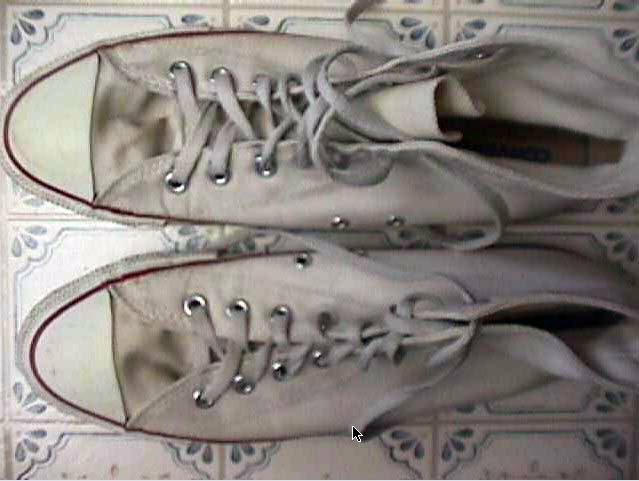 37 Optical White High Top Chucks Top view of vintage optical white high tops. 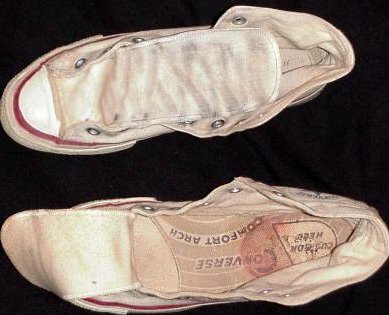 38 Optical White High Top Chucks Inside patch and angle rear views of worn optical white high tops. 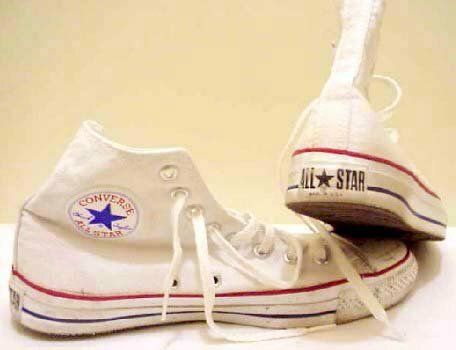 39 Optical White High Top Chucks Side views of worn optical white high tops. 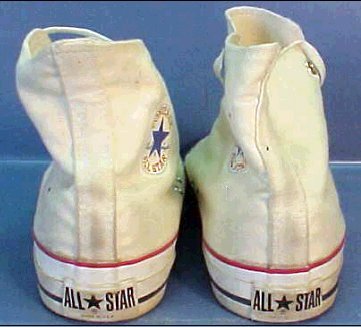 40 Optical White High Top Chucks Rear view of worn optical white high tops. 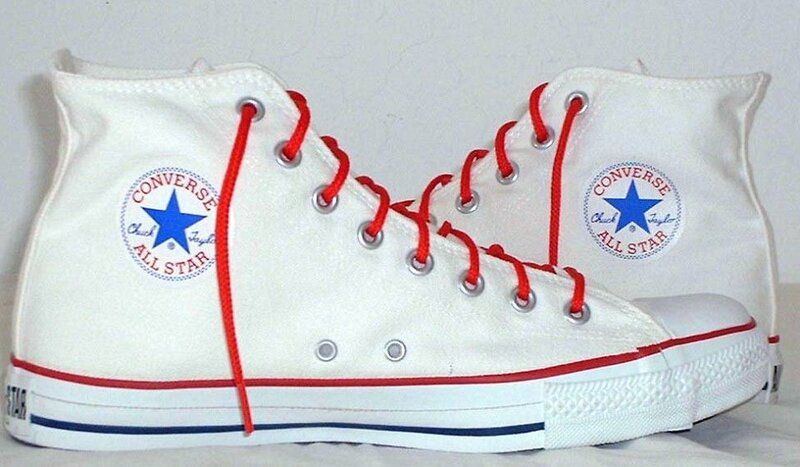 41 Optical White High Top Chucks Inside patch views of optical white high tops with narrow red laces. 42 Optical White High Top Chucks Sole view of optical white high tops. 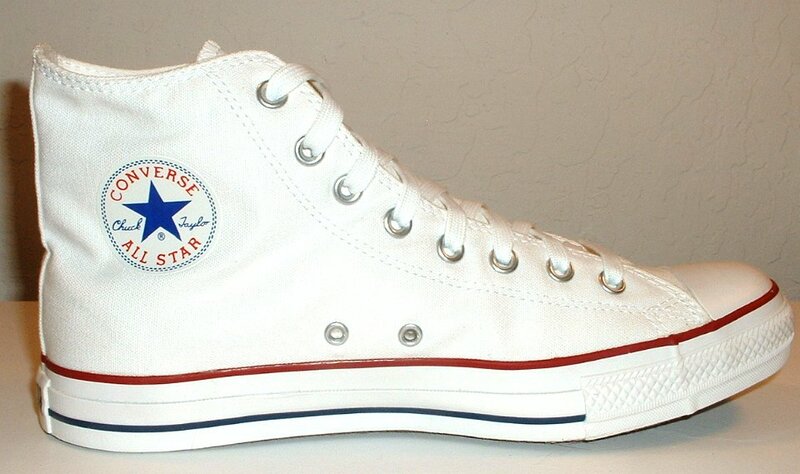 43 Optical White High Top Chucks Inside patch view of a left optical white high top with royal bue laces. 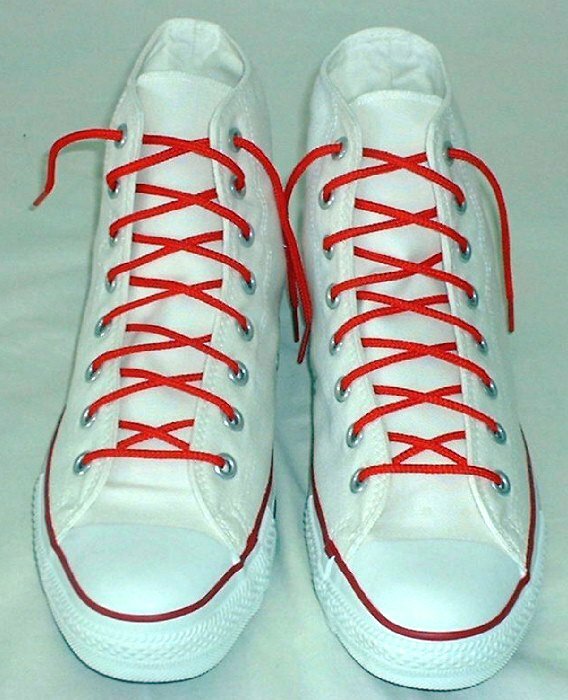 44 Optical White High Top Chucks Angled front view of optical white high tops with narrow red laces. 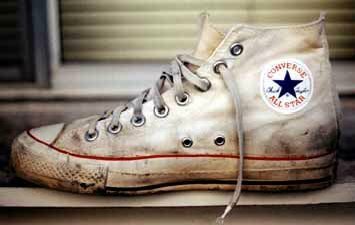 45 Optical White High Top Chucks Front view of worn and dirty optical white high tops. 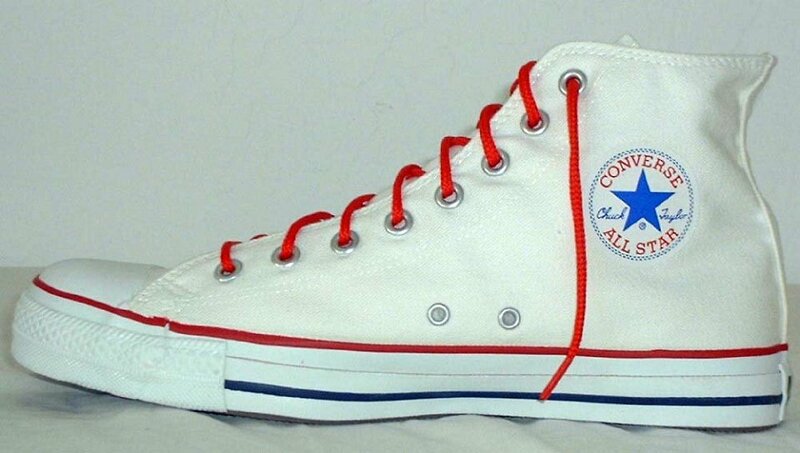 46 Optical White High Top Chucks Front view of optical white high tops with narrow red laces. 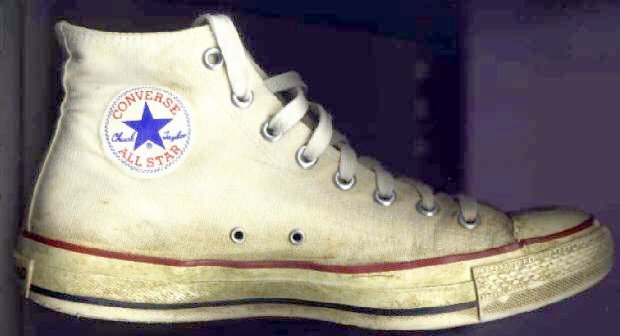 47 Optical White High Top Chucks Rear view of vintage optical white high tops. 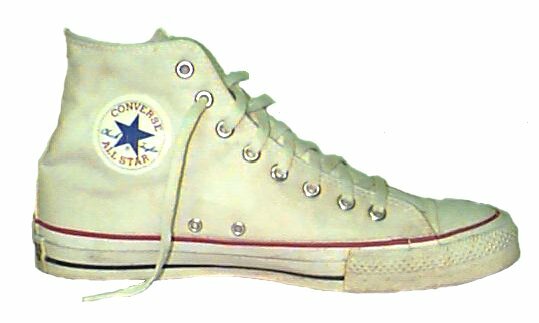 48 Optical White High Top Chucks Optical white high tops with rainbow laces, inside patch and sole views. 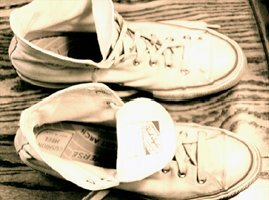 49 Optical White High Top Chucks Top and inside patch views of a new vintage unlaced pair of optical white high tops. 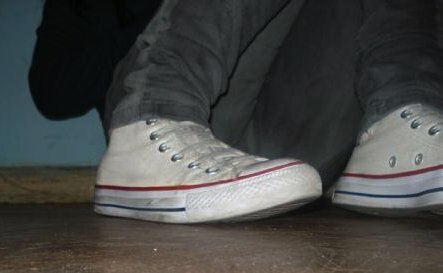 50 Optical White High Top Chucks Inside patch and rear views of worn optical white high tops. 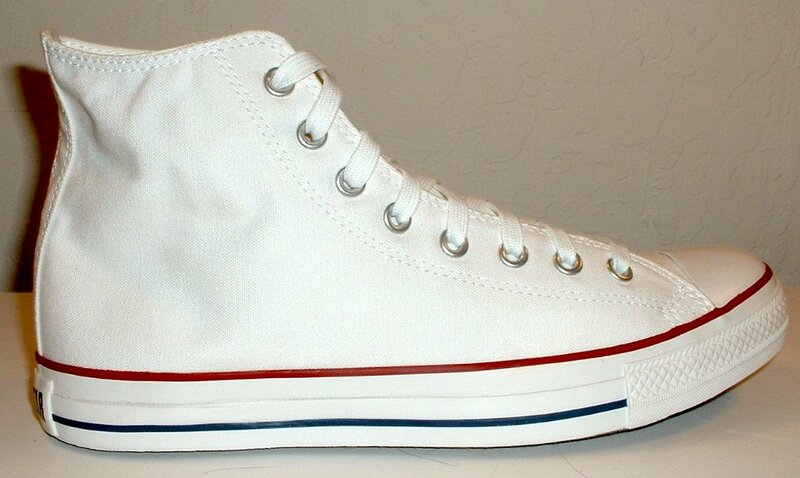 51 Optical White High Top Chucks Inside patch view of a right optical white high top with narrow red laces. 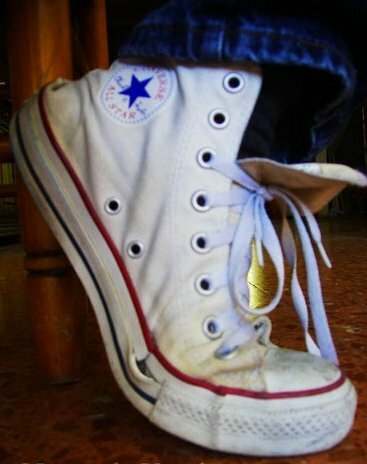 52 Optical White High Top Chucks Angled side view of optical white high tops. 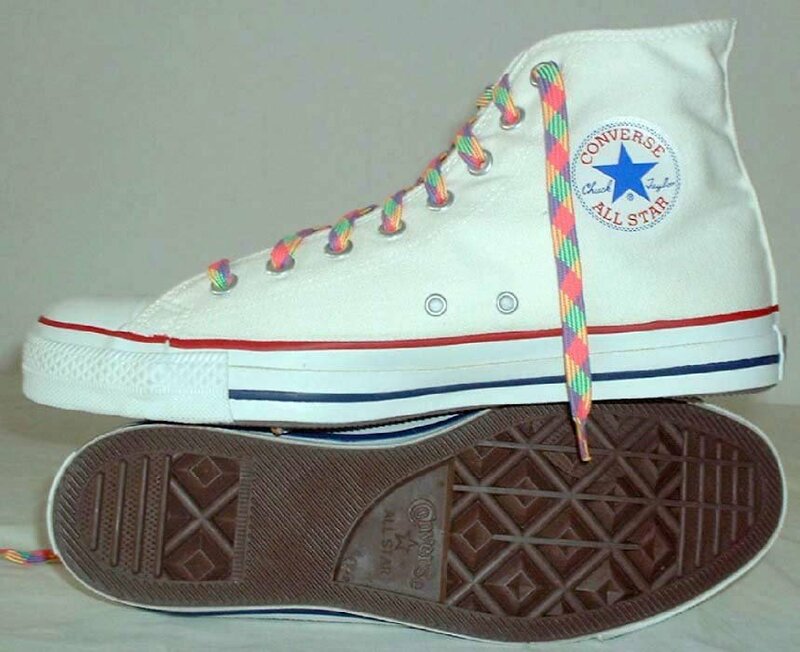 53 Optical White High Top Chucks Inside patch views of optical white high tops with rainbow laces. 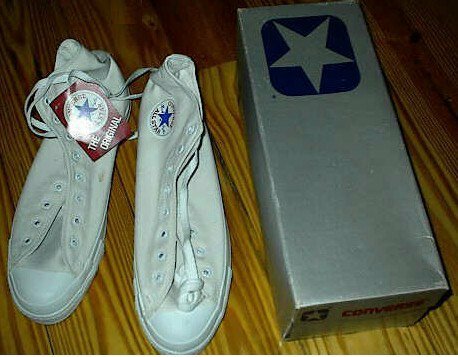 54 Optical White High Top Chucks Brand new pair of optical white high tops with box, inside patch and sole views. 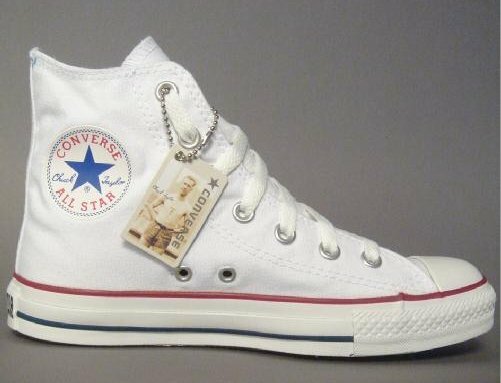 55 Optical White High Top Chucks New pair of optical white high tops with tag. 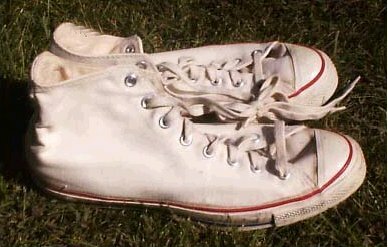 56 Optical White High Top Chucks Top view of worn vintage optical white high tops without laces. 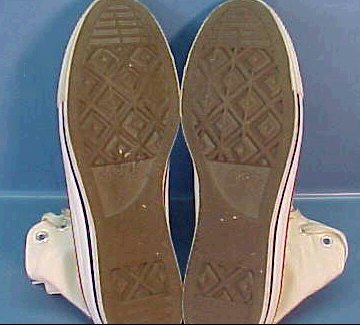 57 Optical White High Top Chucks Rear and angled sole view of optical white high tops. 58 Optical White High Top Chucks Side view of optical white high tops. 59 Optical White High Top Chucks Inside patch view of a left optical white high top. 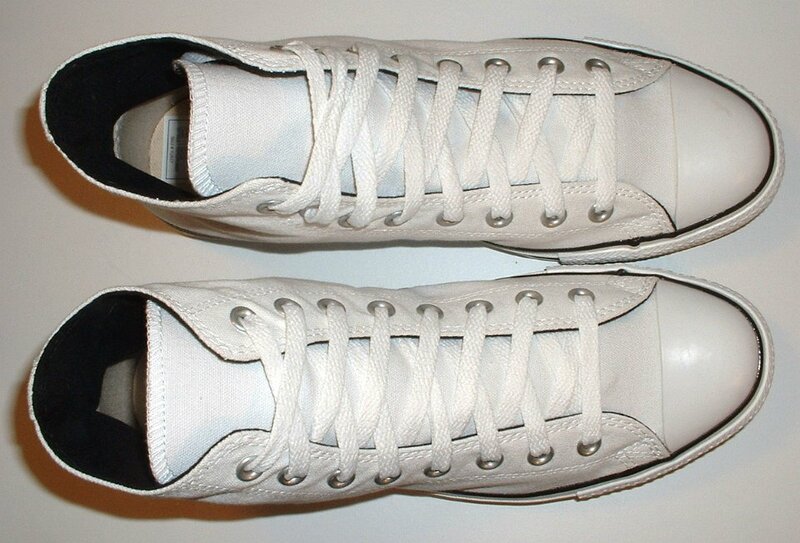 60 Optical White High Top Chucks Angled side view of optical white high tops. 61 Optical White High Top Chucks Front and angled inside patch view of optical white high tops. 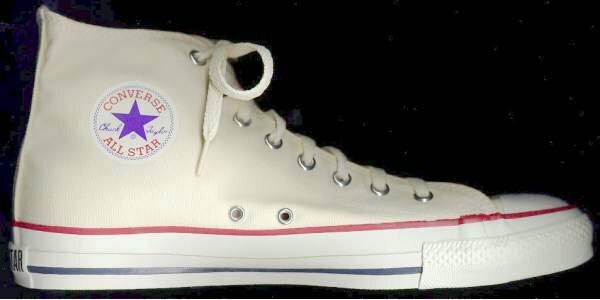 63 Optical White High Top Chucks Optical white high tops, inside patch views. 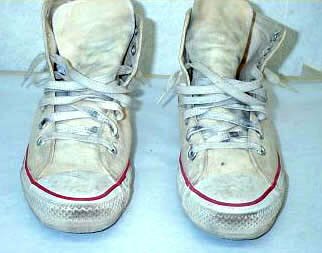 64 Optical White High Top Chucks Inside patch views of worn optical white high tops. 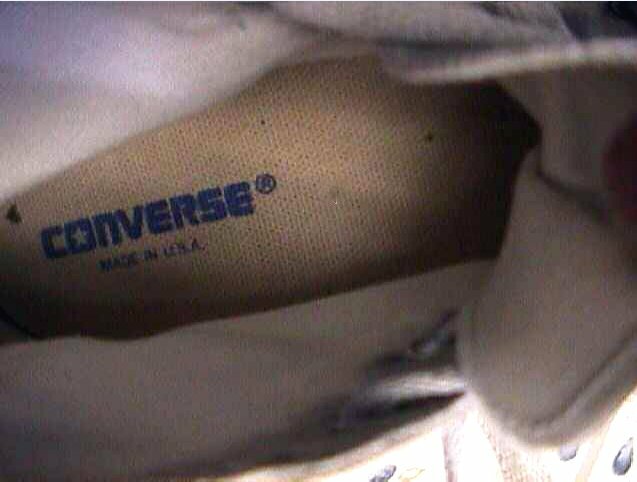 65 Optical White High Top Chucks Closeup of the insole of an optical white high top. 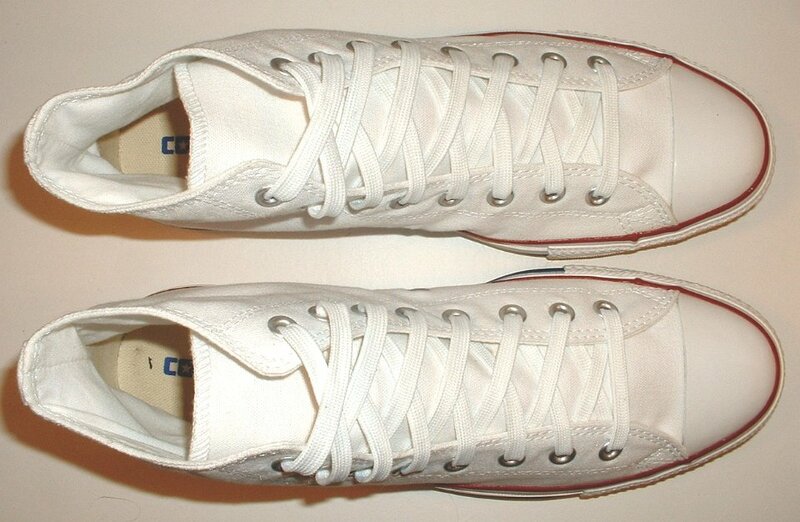 66 Optical White High Top Chucks Worn optical white high tops, top view. 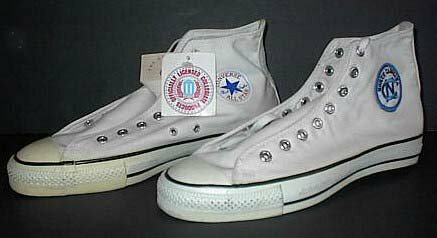 67 Optical White High Top Chucks Made in USA optical white high tops, inside patch and rear views. 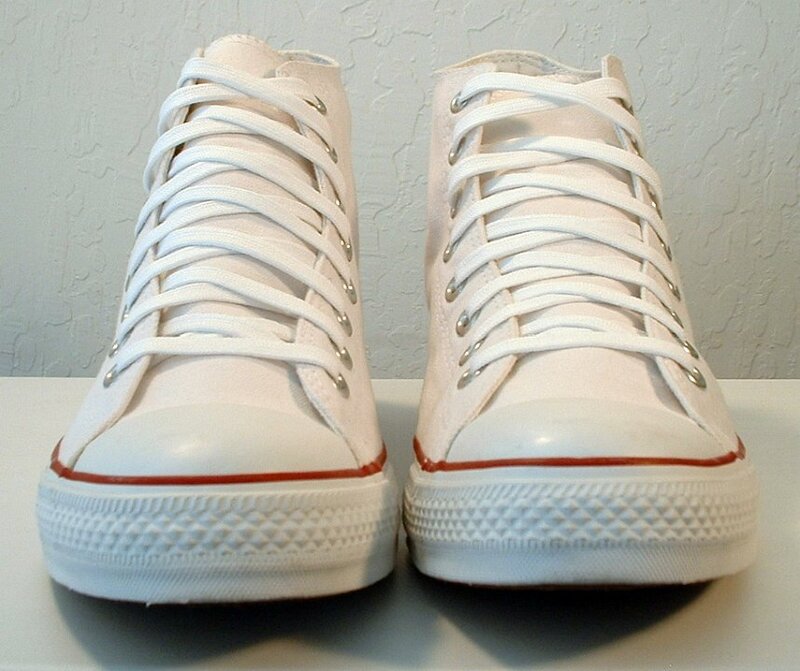 68 Optical White High Top Chucks Angled side views of optical white high tops. 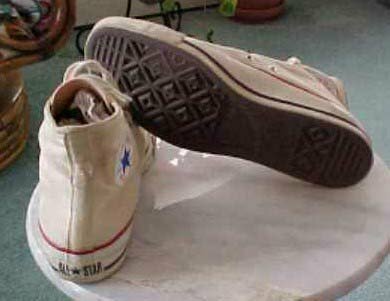 69 Optical White High Top Chucks Inside patch view of a right optical white high top chuck. 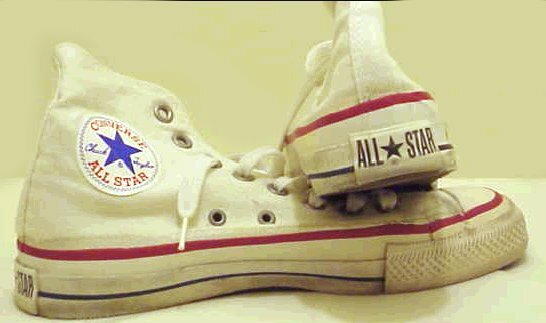 70 Optical White High Top Chucks Outside view of a right optical white high top chuck. 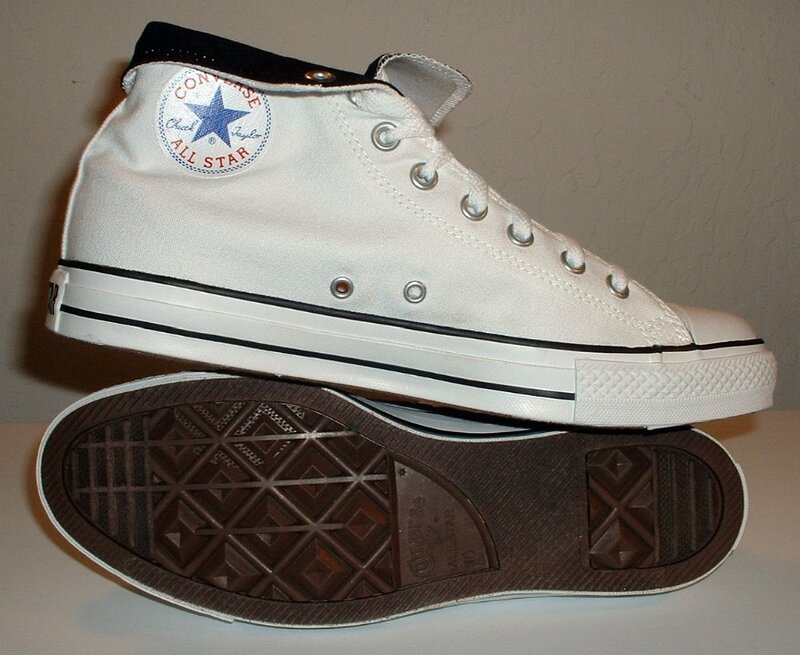 71 Optical White High Top Chucks Inside patch view of a right optical white high top chuck. 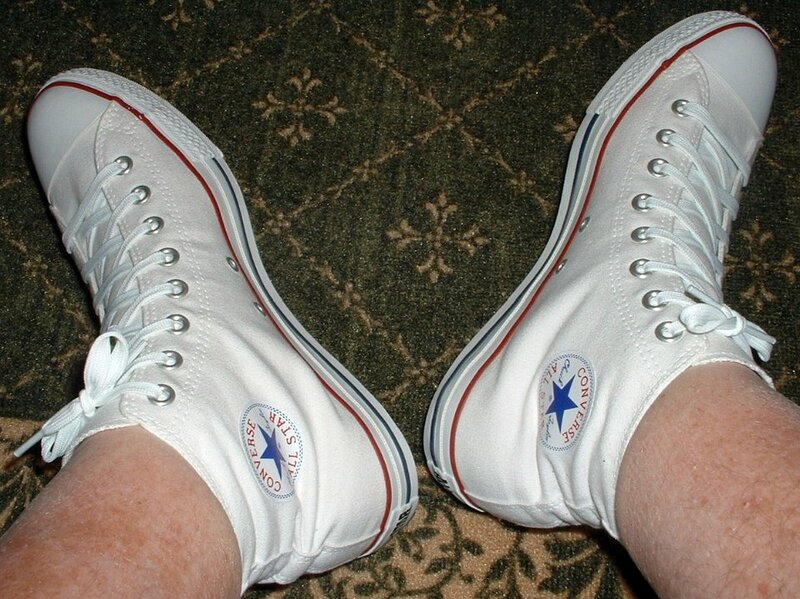 72 Optical White High Top Chucks Outside view of a right optical white high top chuck. 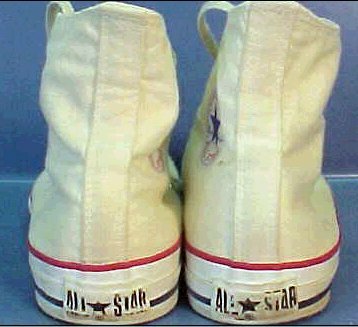 73 Optical White High Top Chucks Rear view of optical white high top chucks. 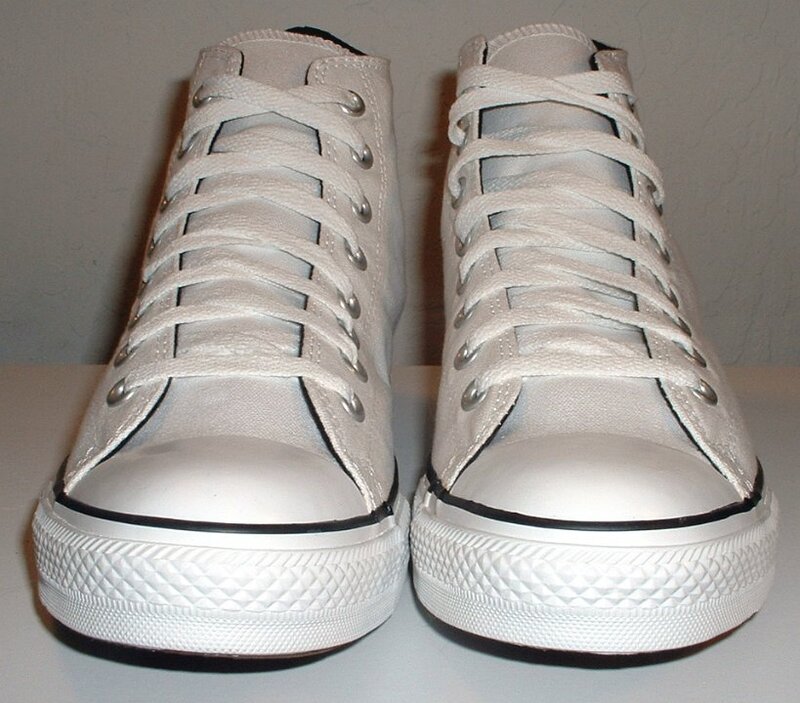 74 Optical White High Top Chucks Angled side view of optical white high top chucks. 75 Optical White High Top Chucks Front view of optical white high top chucks. 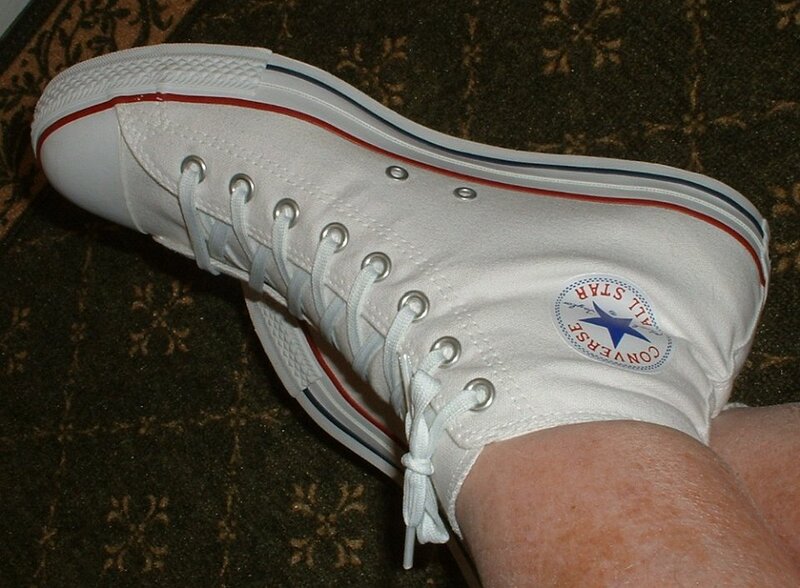 76 Optical White High Top Chucks Angled side view of optical white high top chucks. 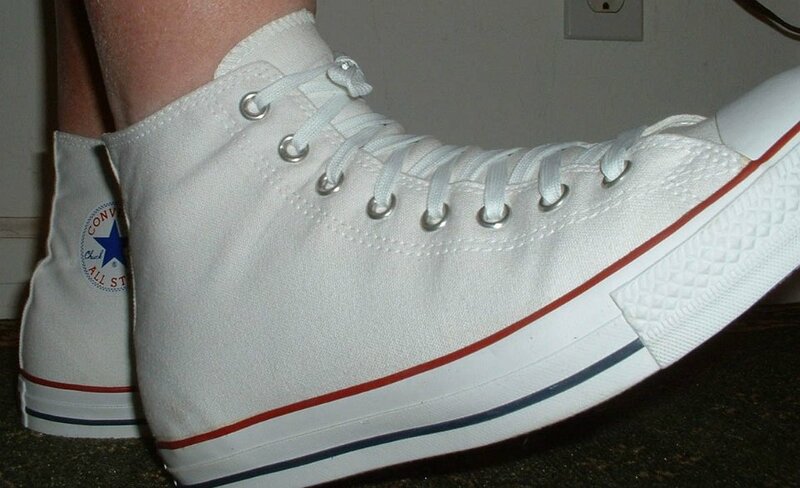 77 Optical White High Top Chucks Top view of optical white high top chucks. 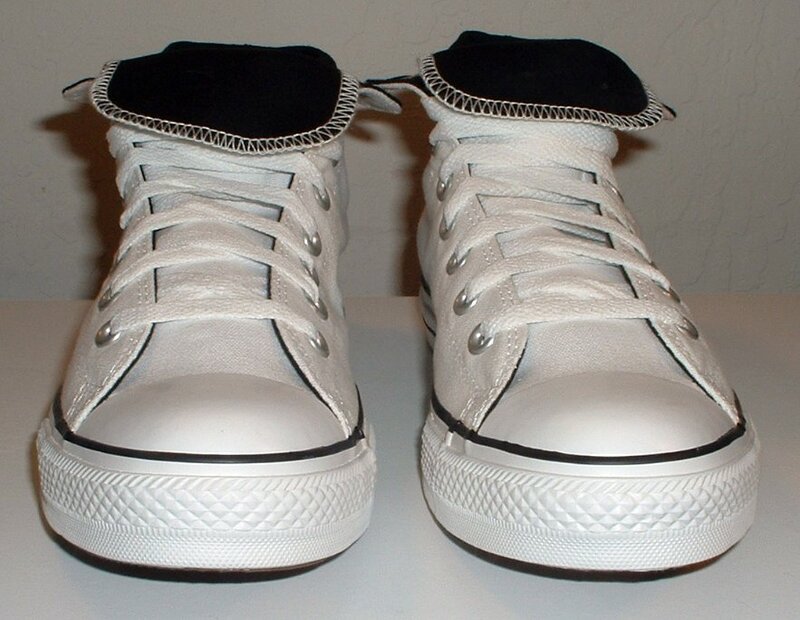 78 Optical White High Top Chucks Inside patch views of optical white high top chucks. 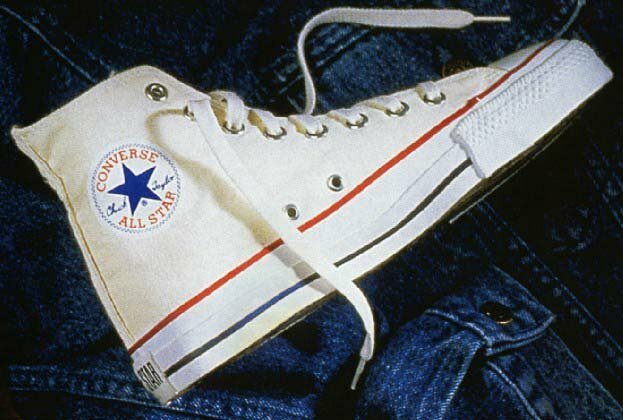 79 Optical White High Top Chucks Inside patch and sole views of optical white high top chucks. 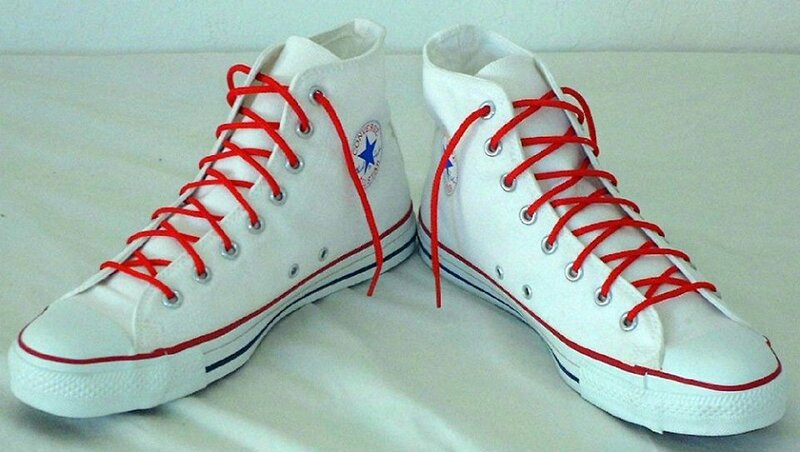 80 Optical White High Top Chucks Product red version of optical white high tops. 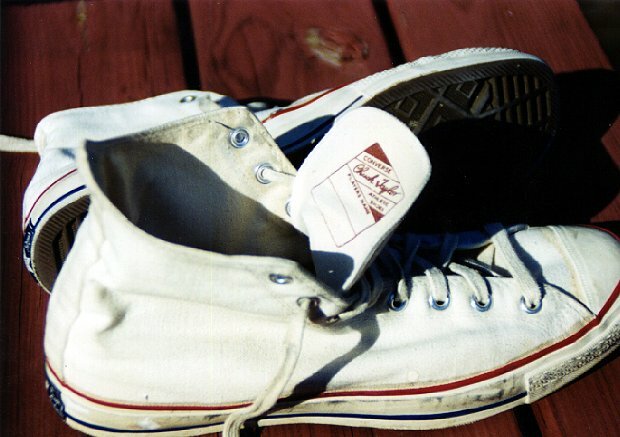 81 Optical White High Top Chucks Custom made North Carolina high tops showing the NC patch. 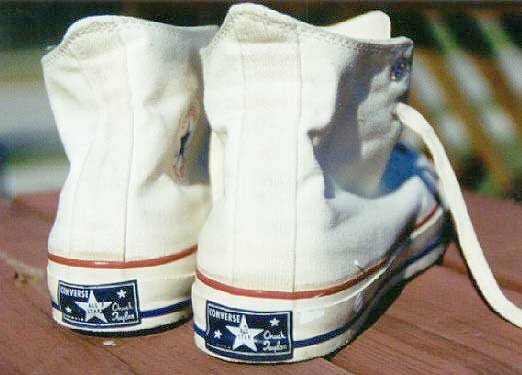 82 Optical White High Top Chucks North Carolina optical white high tops showing both the standard Chuck Taylor patch and NC patch. 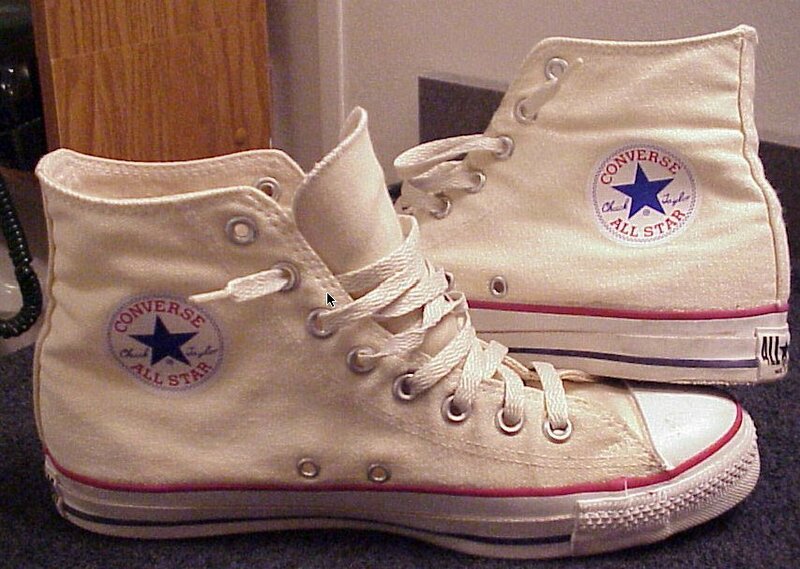 83 Optical White High Top Chucks Wearing optical white high top chucks. 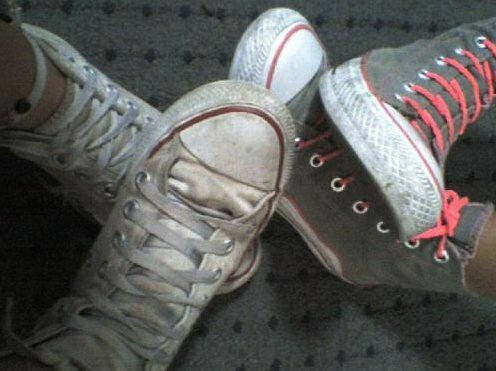 84 Optical White High Top Chucks Wearing optical white high top chucks, with natural white high tops on the left, and monochrome and red extra high tops on the right. 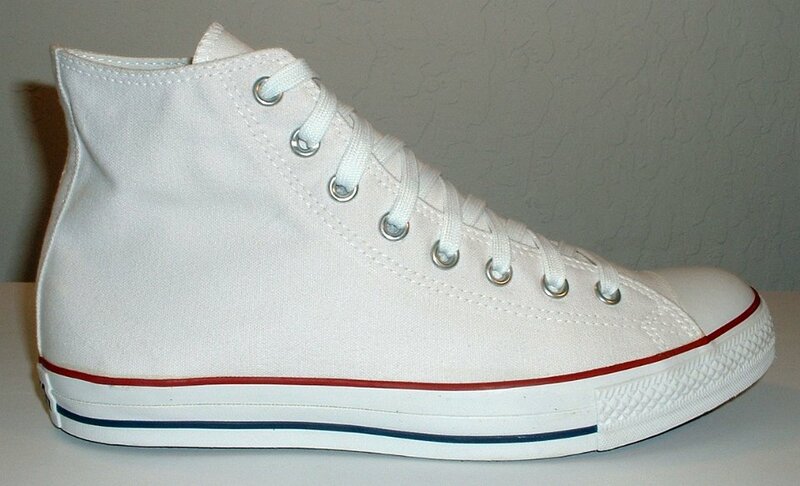 85 Optical White High Top Chucks Wearing product red white high top chucks. 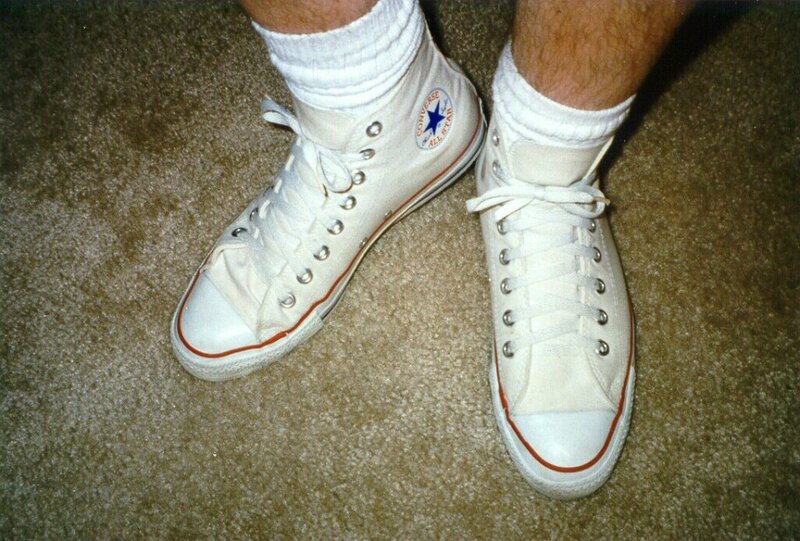 86 Optical White High Top Chucks Wearing paired optical white high top chucks. 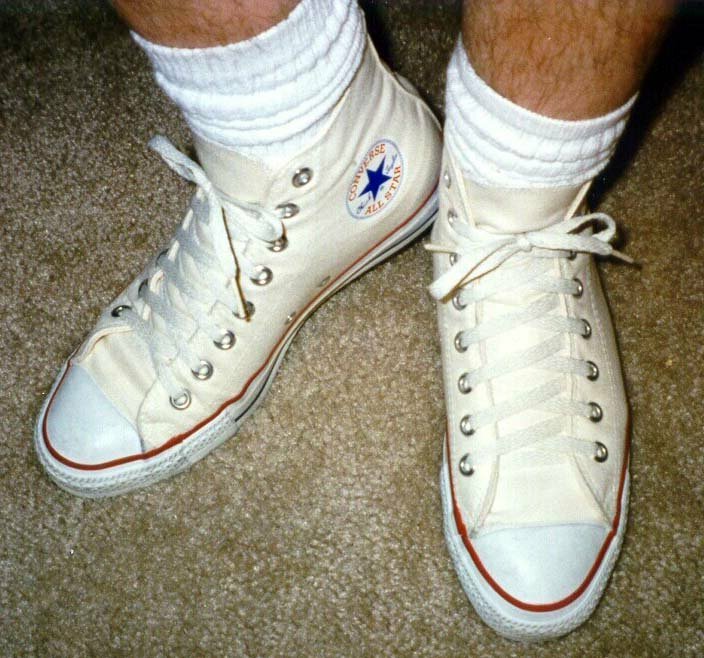 87 Optical White High Top Chucks Wearing paired optical white high top chucks. 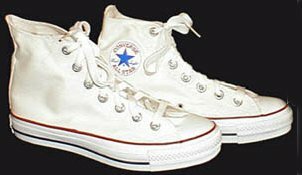 88 Optical White High Top Chucks Wearing optical white high top chucks. 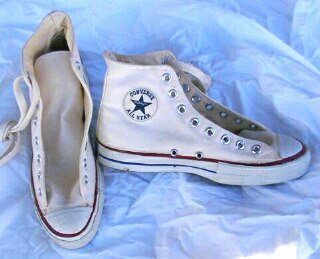 89 Optical White High Top Chucks Wearing optical white high top chucks. 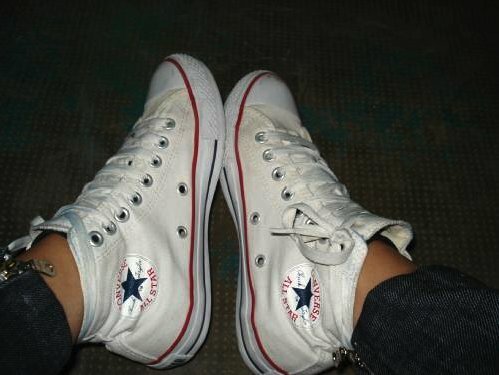 90 Optical White High Top Chucks Wearing optical white high top chucks. 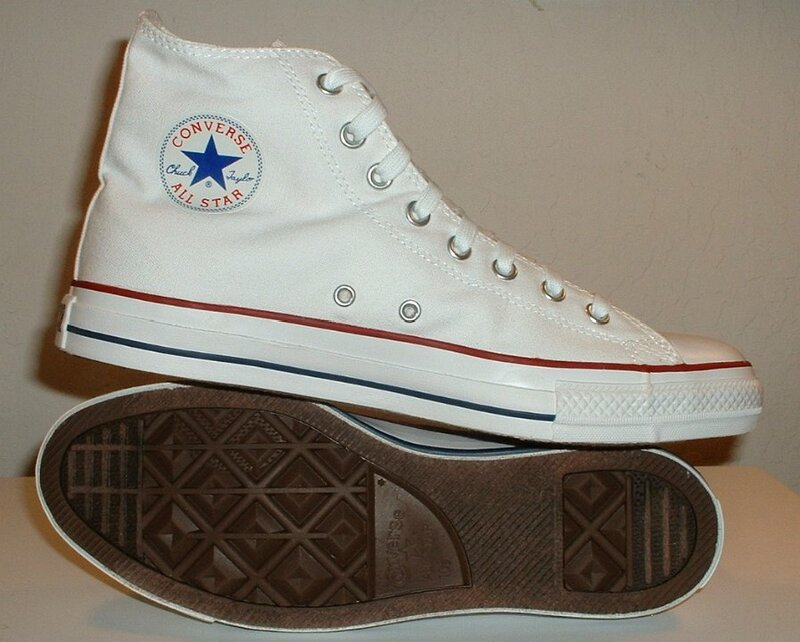 91 Optical White High Top Chucks Wearing optical white high top chucks, toe cap view. 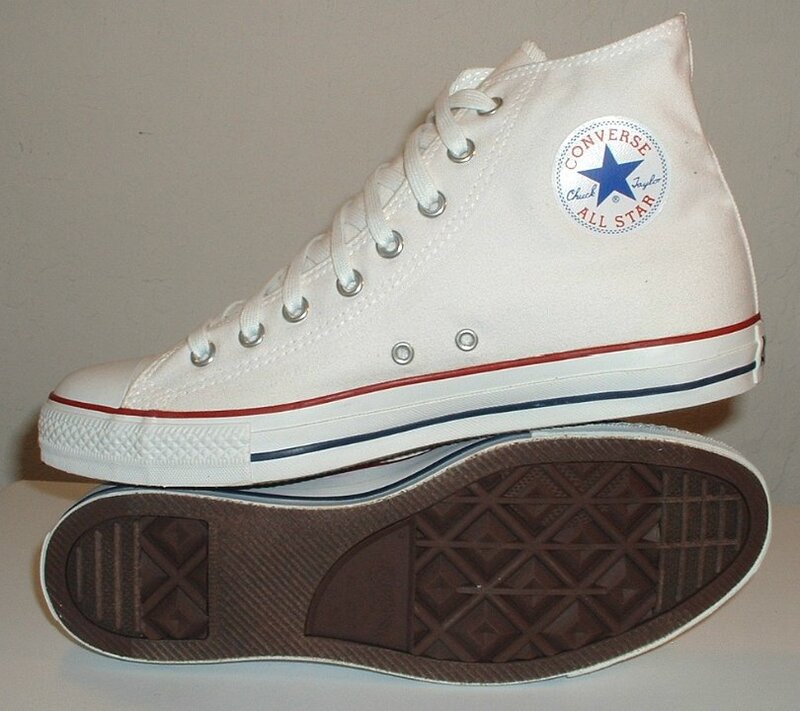 92 Optical White High Top Chucks Wearing optical white high top chucks. 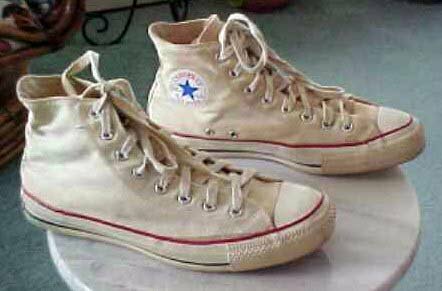 93 Optical White High Top Chucks Wearing optical white high top chucks. 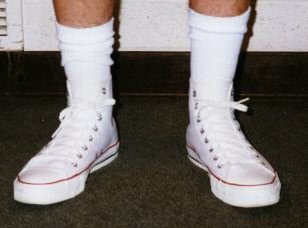 94 Optical White High Top Chucks Wearing optical white high top chucks. 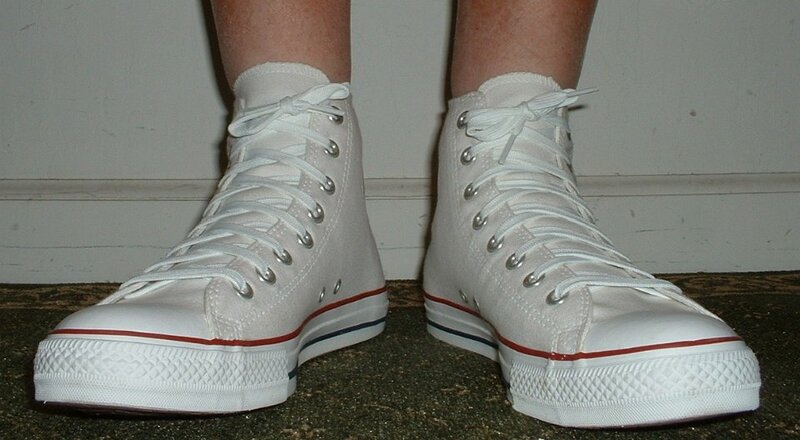 95 Optical White High Top Chucks Wearing criss-cross laced optical white high top chucks. 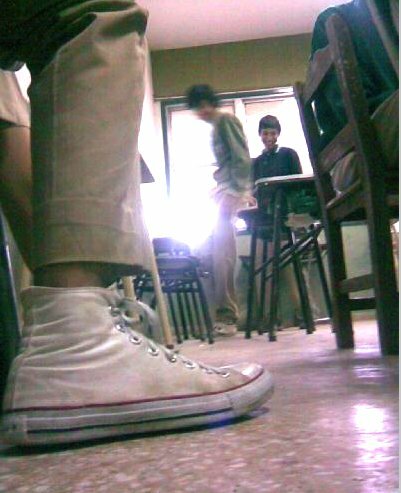 96 Optical White High Top Chucks Wearing optical white high top chucks. 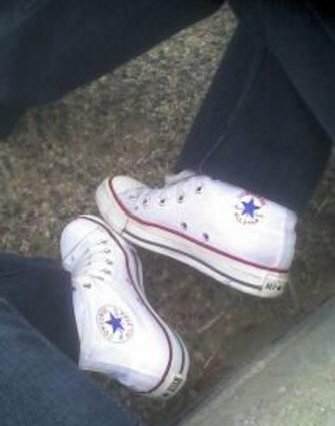 97 Optical White High Top Chucks Wearing optical white high top chucks. 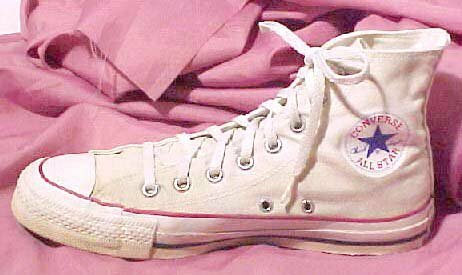 98 Optical White High Top Chucks Wearing optical white high top chucks. 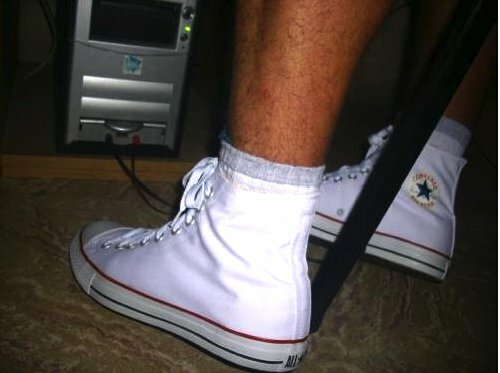 99 Optical White High Top Chucks Wearing optical white high top chucks. 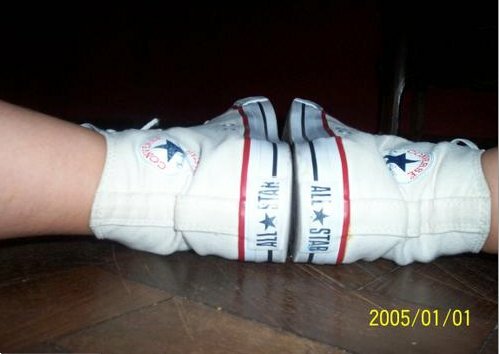 100 Optical White High Top Chucks Wearing optical white high top chucks. 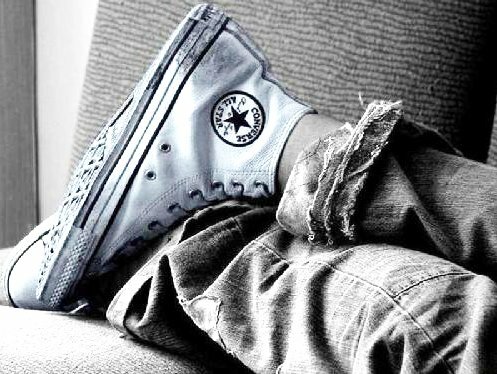 101 Optical White High Top Chucks Wearing optical white high top chucks. 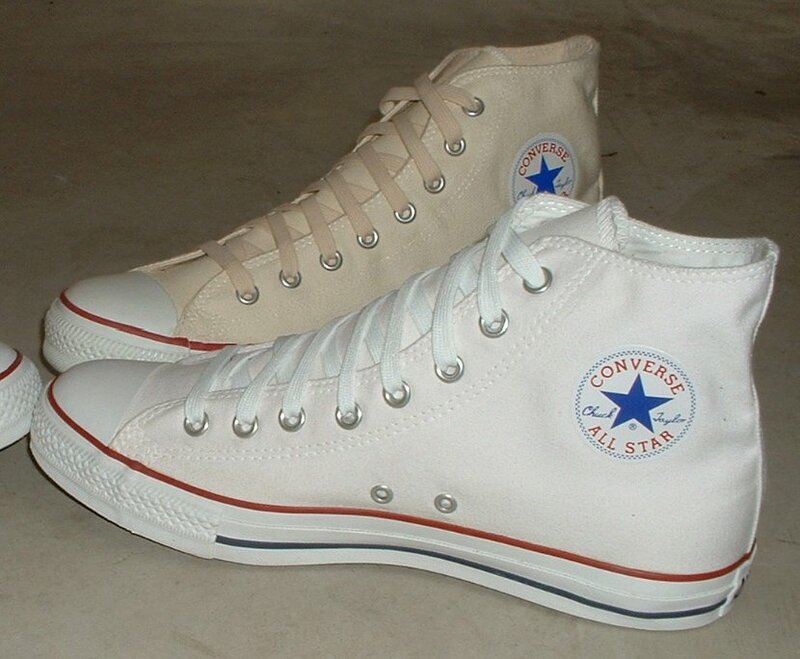 102 Optical White High Top Chucks Wearing optical white high top chucks. 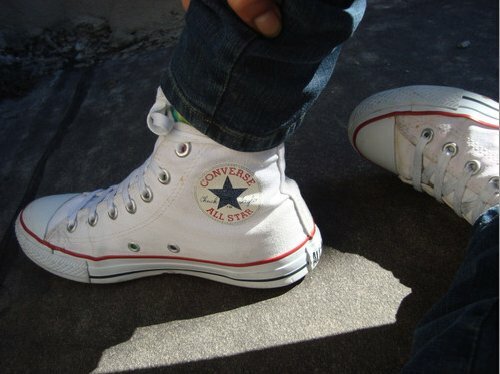 103 Optical White High Top Chucks Wearing optical white high top chucks. 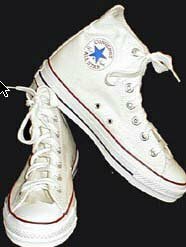 104 Optical White High Top Chucks Wearing optical white high top chucks. 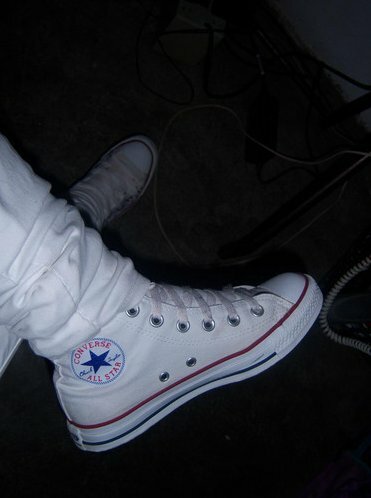 105 Optical White High Top Chucks Wearing optical white high top chucks. 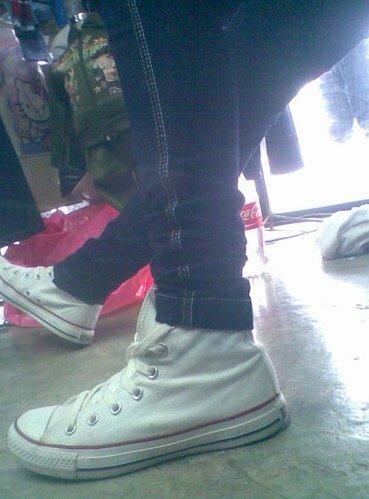 106 Optical White High Top Chucks Wearing optical white high top chucks. 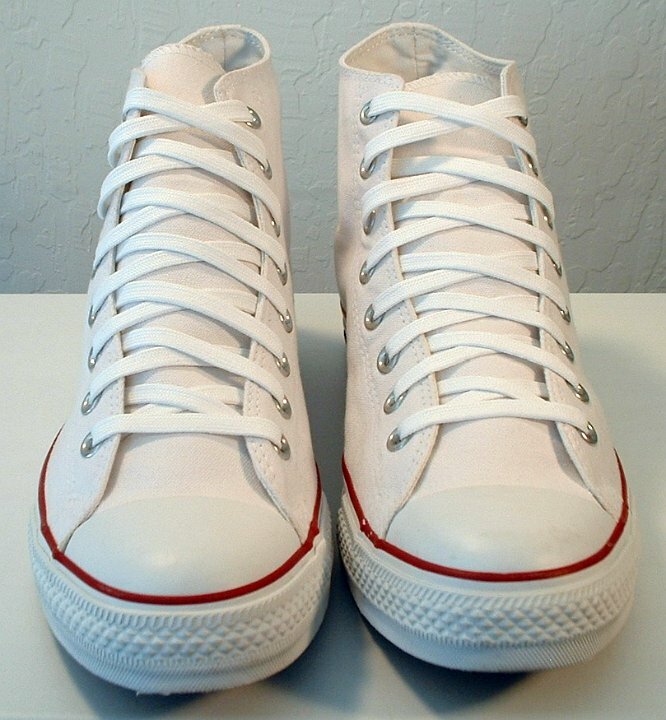 107 Optical White High Top Chucks Wearing optical white high top chucks. 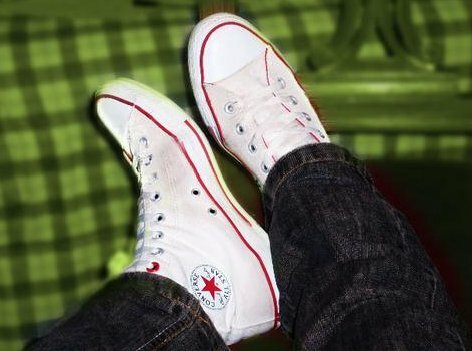 108 Optical White High Top Chucks Wearing optical white high top chucks. 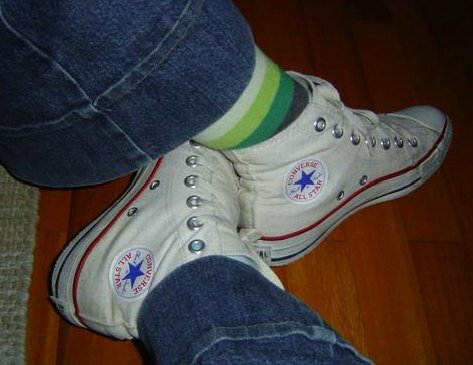 109 Optical White High Top Chucks Wearing optical white high top chucks. 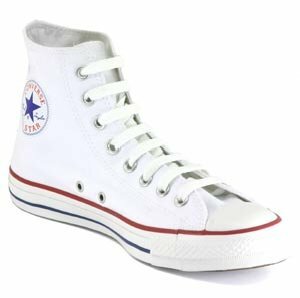 110 Optical White High Top Chucks Wearing optical white high top chucks. 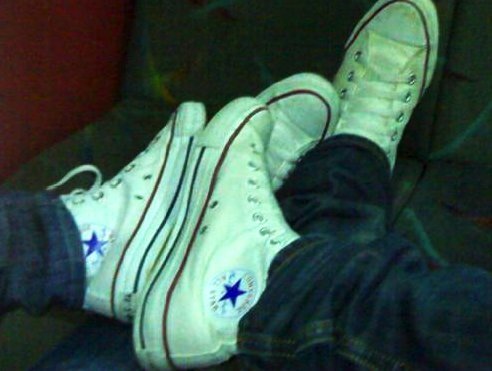 111 Optical White High Top Chucks Wearing optical white high top chucks. 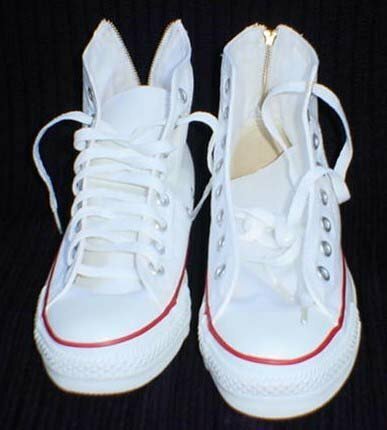 112 Optical White High Top Chucks Wearing optical white high top chucks. 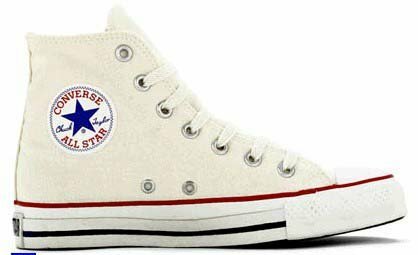 113 Optical White High Top Chucks Wearing optical white high top chucks. 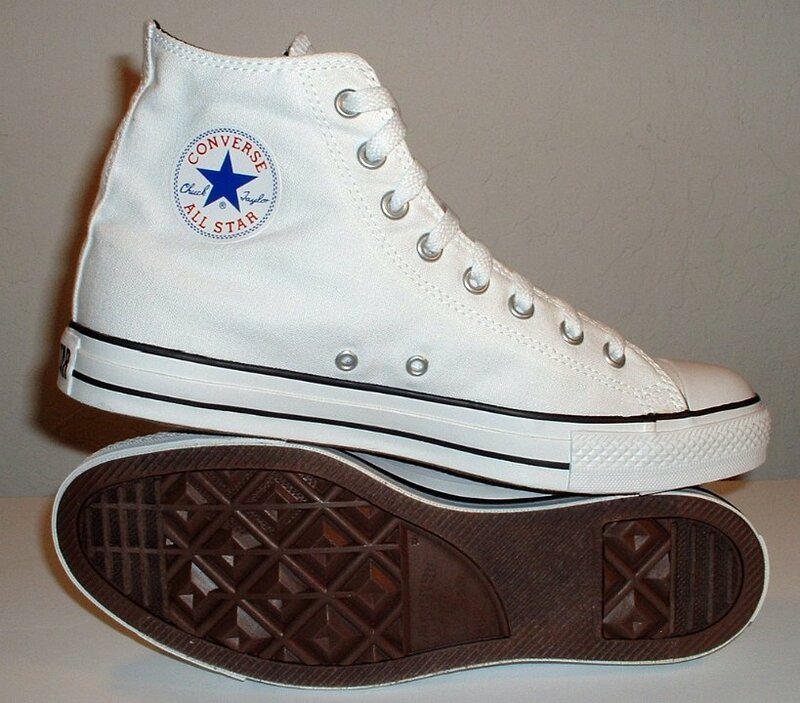 114 Optical White High Top Chucks Wearing optical white high top chucks. 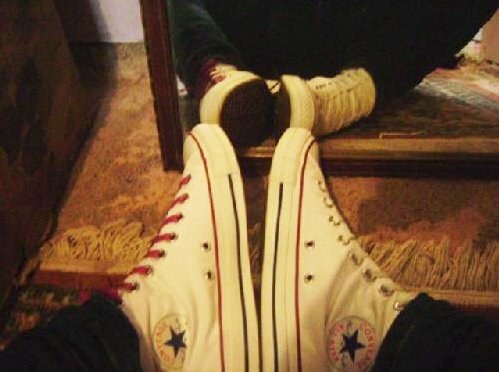 115 Optical White High Top Chucks Wearing optical white high top chucks. 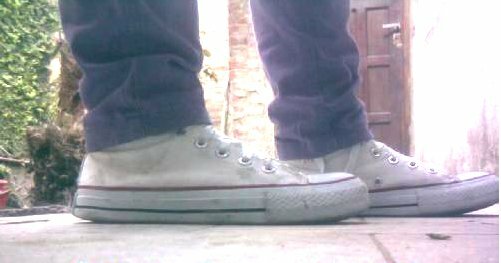 116 Optical White High Top Chucks Wearing optical white high tops in foldover style. 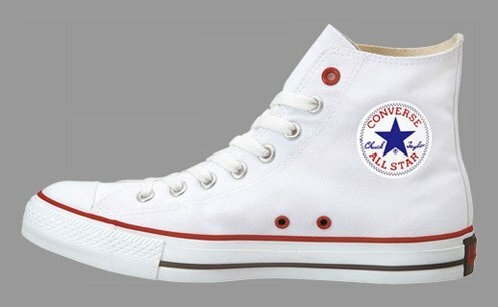 117 Optical White High Top Chucks Wearing optical white high top chucks. 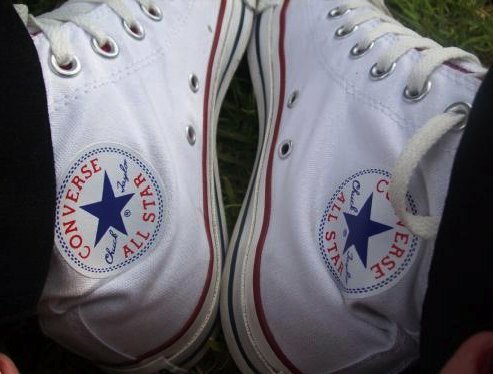 118 Optical White High Top Chucks Wearing optical white high top chucks. 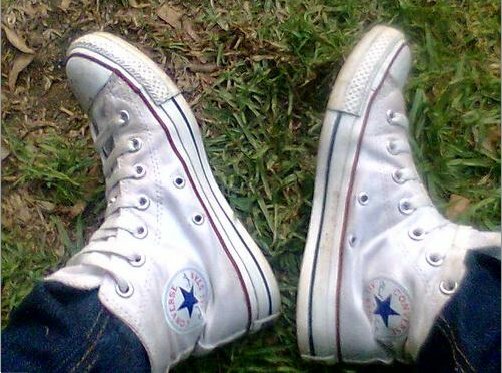 119 Optical White High Top Chucks Kicking back in worn optical white high tops. 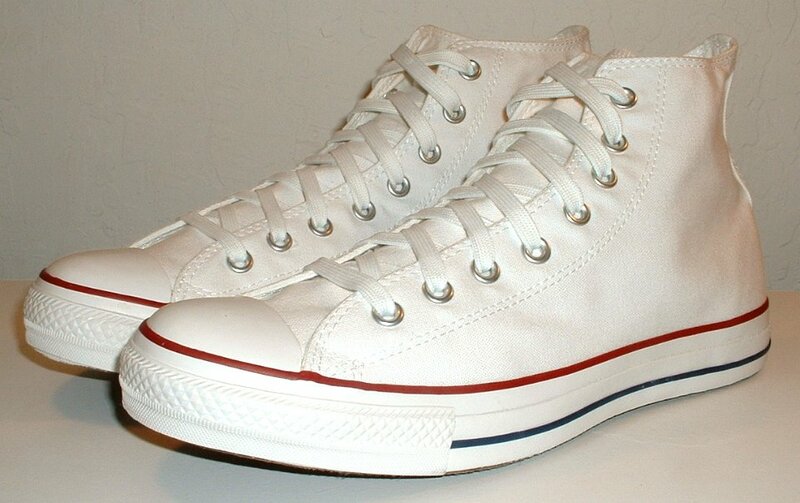 120 Optical White High Top Chucks Wearing optical white high tops, top view from the front. 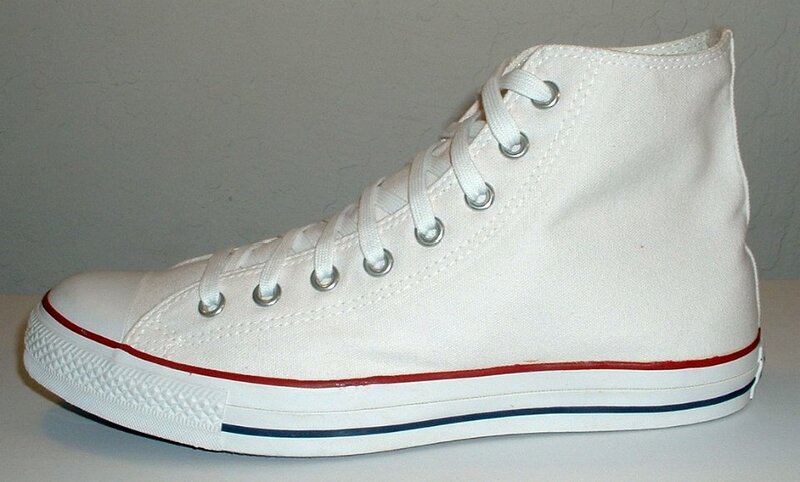 121 Optical White High Top Chucks Wearing optical white high top chucks. 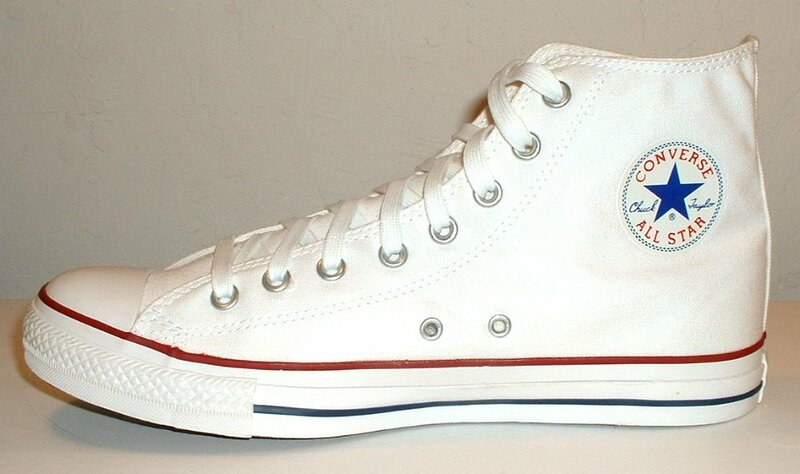 122 Optical White High Top Chucks Wearing optical white high top chucks. 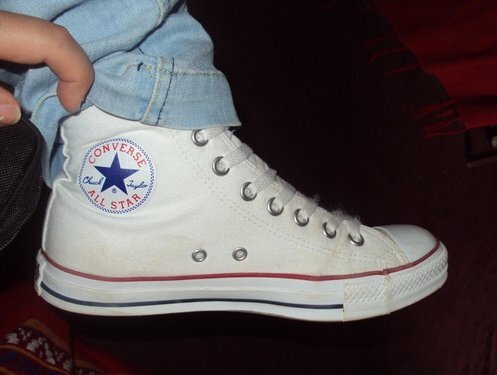 123 Optical White High Top Chucks Wearing optical white high top chucks. 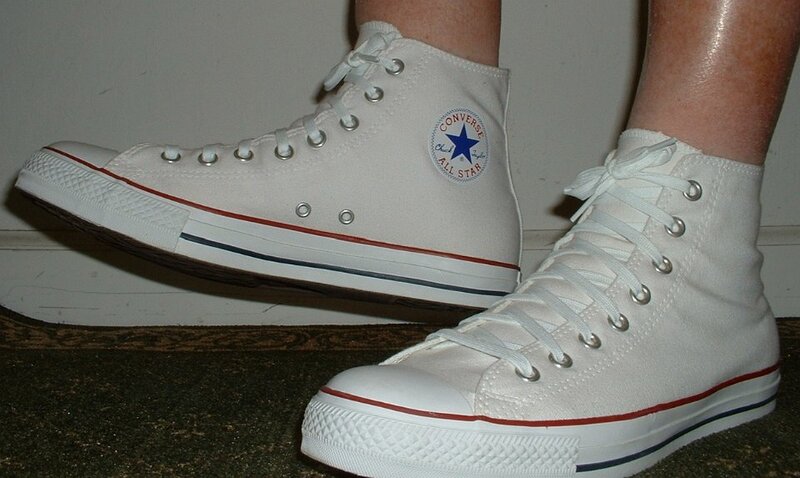 124 Optical White High Top Chucks Wearing optical white high top chucks. 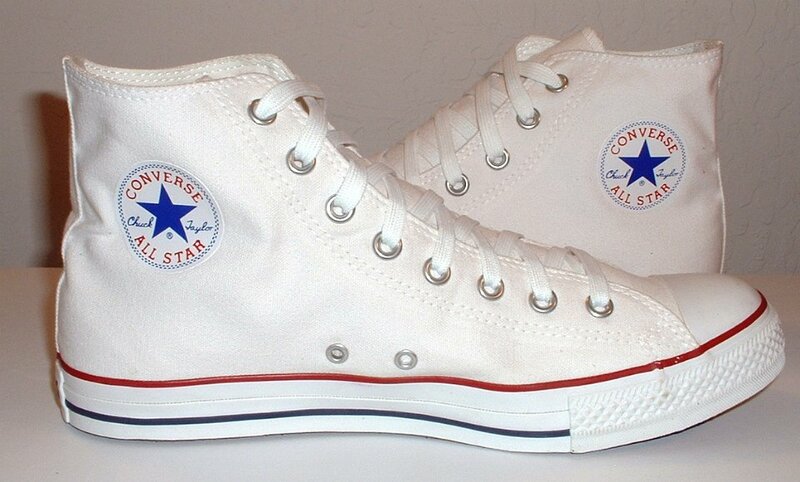 125 Optical White High Top Chucks Wearing optical white high top chucks. 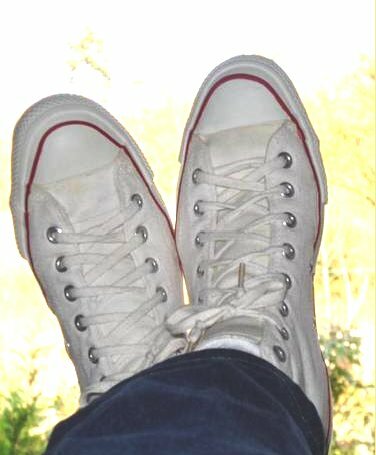 126 Optical White High Top Chucks Kicking back in new optical white high tops. 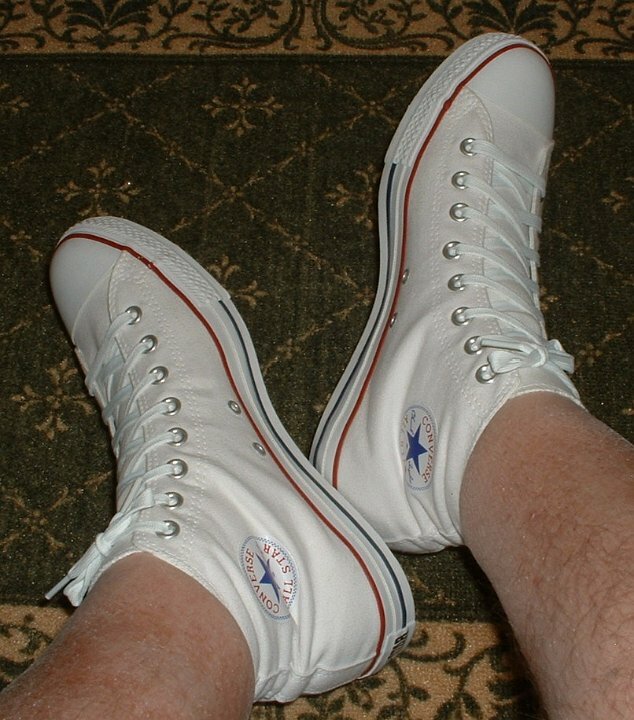 127 Optical White High Top Chucks Kicking back in new optical white high tops, shot 2. 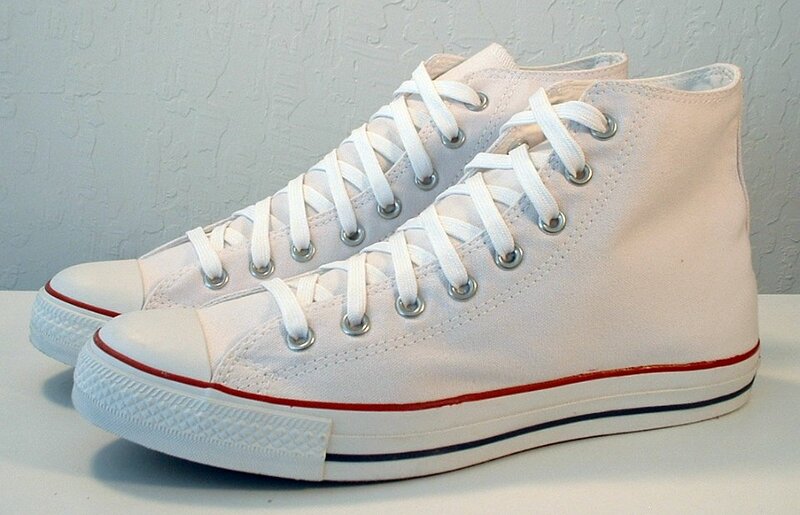 128 Optical White High Top Chucks Wearing new optical white high tops, front view. 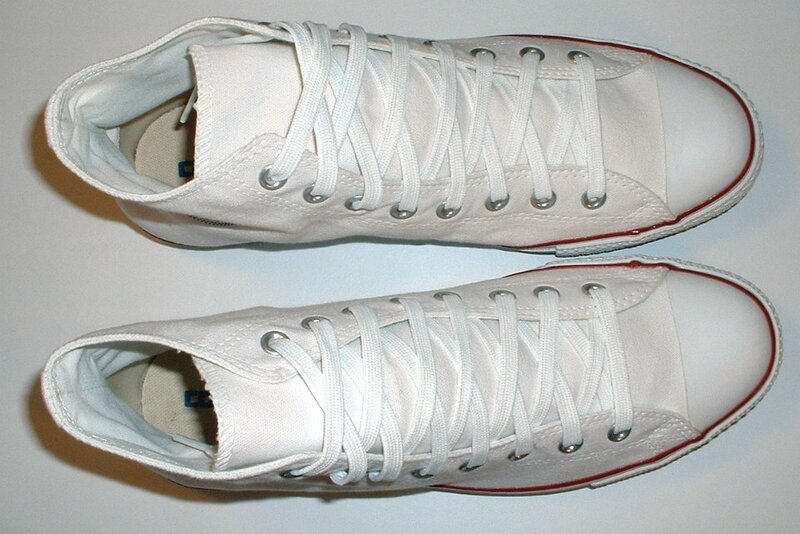 129 Optical White High Top Chucks Stepping forward in optical white high tops. 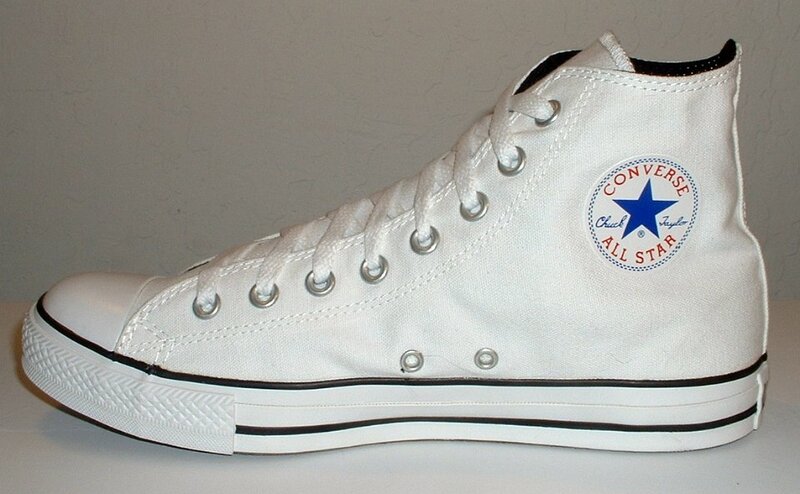 130 Optical White High Top Chucks Stepping forward in optical white high tops, shot 2. 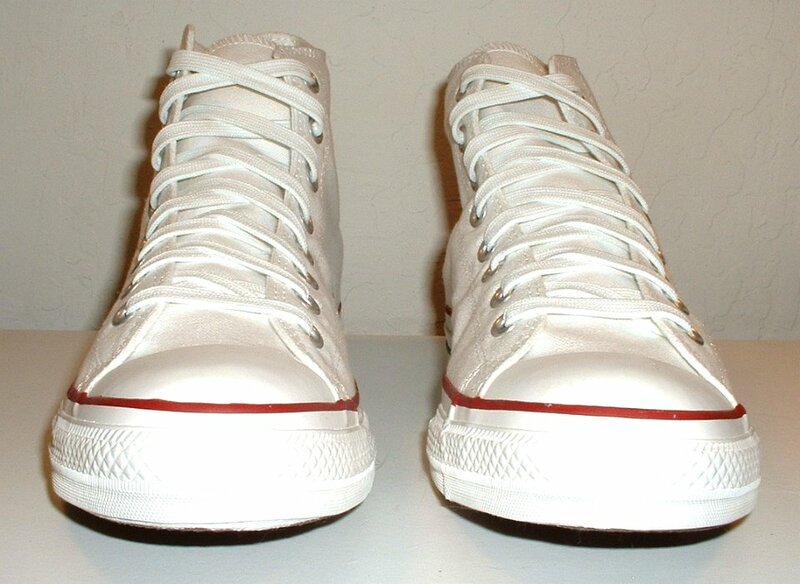 131 Optical White High Top Chucks Taking a step in optical white high top, side view. 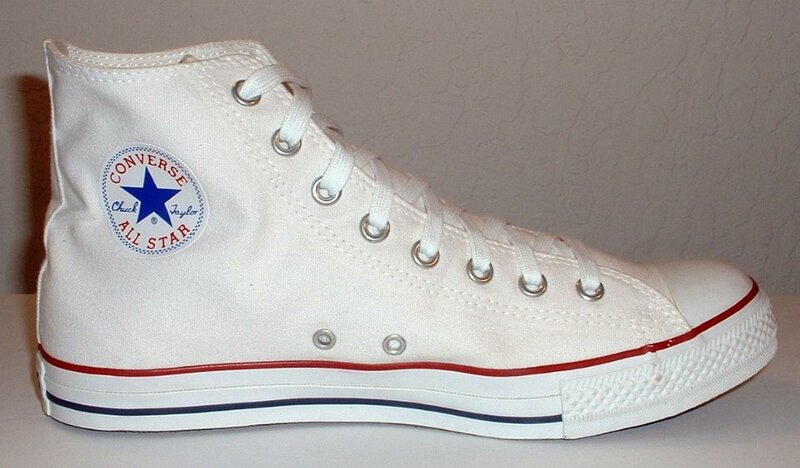 132 Optical White High Top Chucks Stepping forward in optical white high tops. 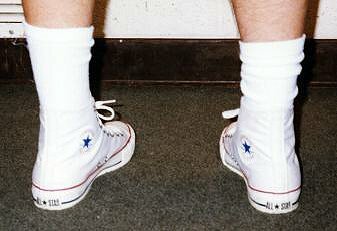 133 Optical White High Top Chucks Wearing optical white high tops, rear view. 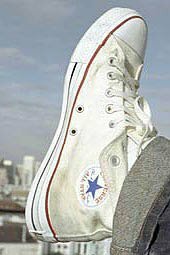 134 Optical White High Top Chucks Closeup of the left sole, optical white high top chucks. 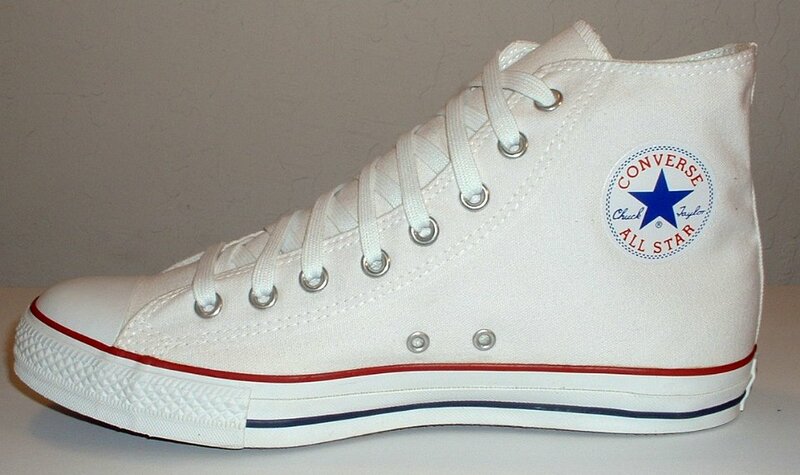 135 Optical White High Top Chucks Stepping up in optical white high top chucks, rear view. 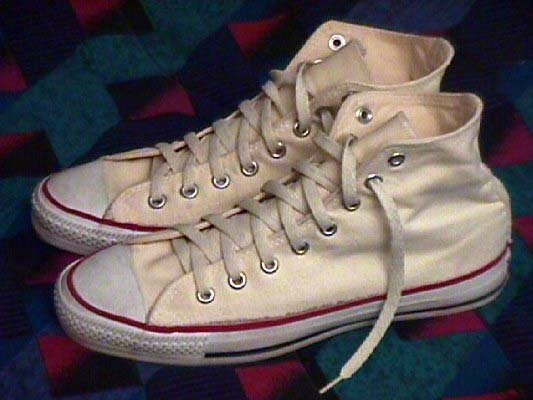 136 Optical White High Top Chucks Stepping out in optical white high tops, right side view. 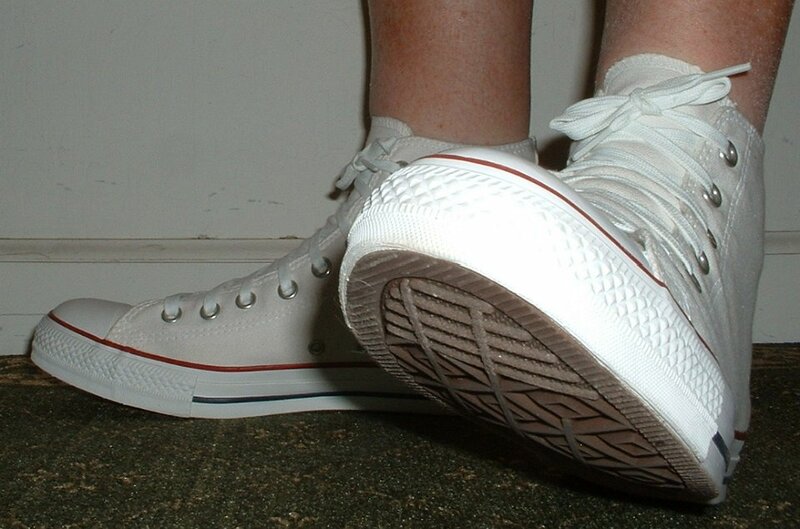 137 Optical White High Top Chucks Stepping out in optical white high tops, closeup of the right shoe. 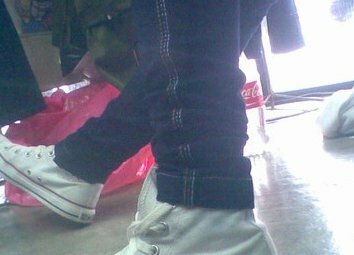 138 Optical White High Top Chucks Wearing laser white high top chucks with a sewn on patch..
139 Optical White High Top Chucks Inside patch view of a right white and black rolldown high top. 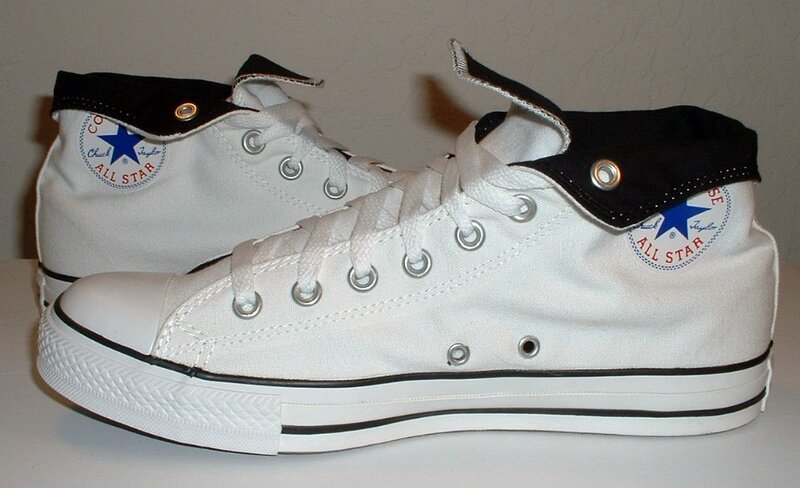 140 Optical White High Top Chucks Outside view of a right optical white and black rolldown high top. 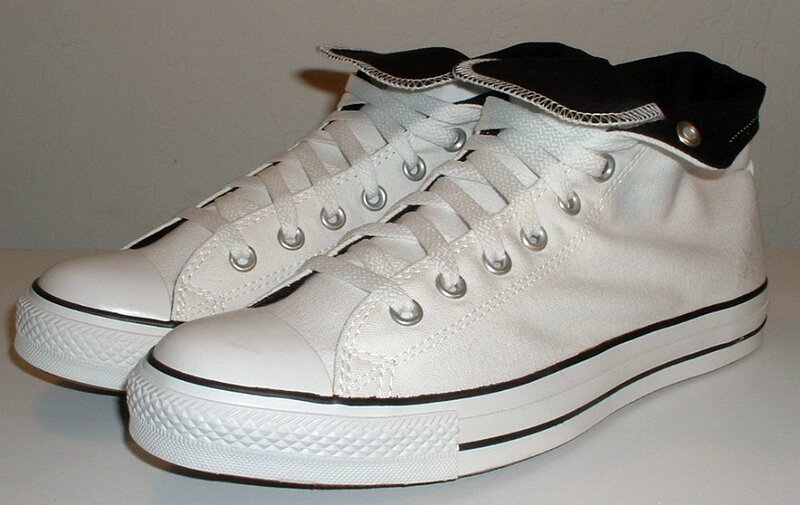 141 Optical White High Top Chucks Inside patch view of a left optical white and black rolldown high top. 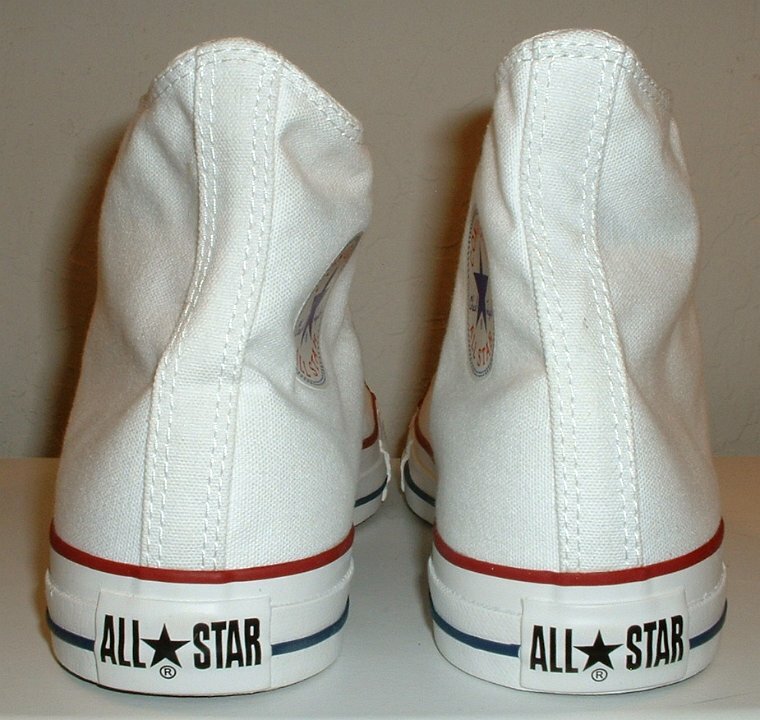 142 Optical White High Top Chucks Outside view of a left optical white and black rolldown high top. 143 Optical White High Top Chucks Rear view of optical white and black rolldown high tops. 144 Optical White High Top Chucks Front view of optical white and black rolldown high tops. 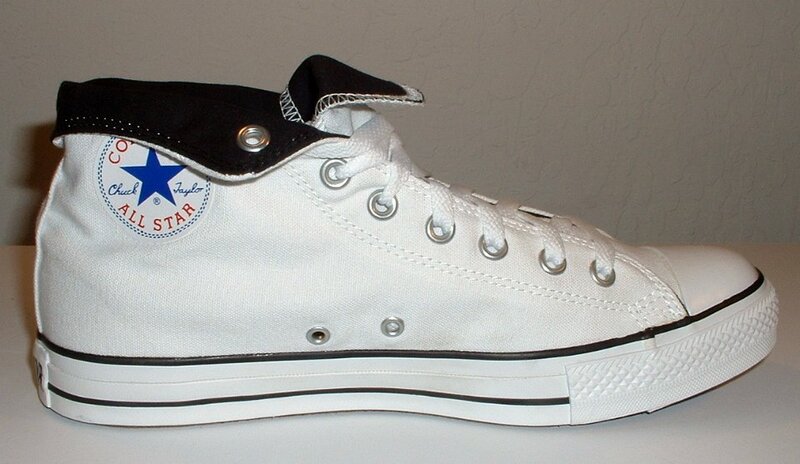 145 Optical White High Top Chucks Angled inside patch view of optical white and black rolldown high tops. 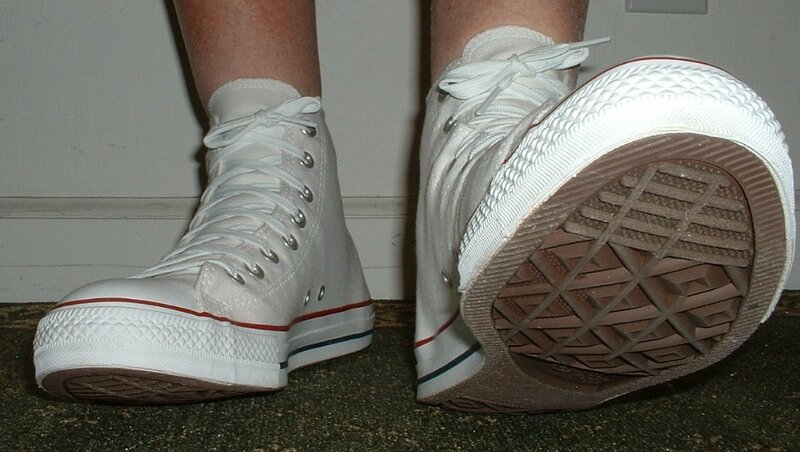 146 Optical White High Top Chucks Top view of optical white and black rolldown high tops. 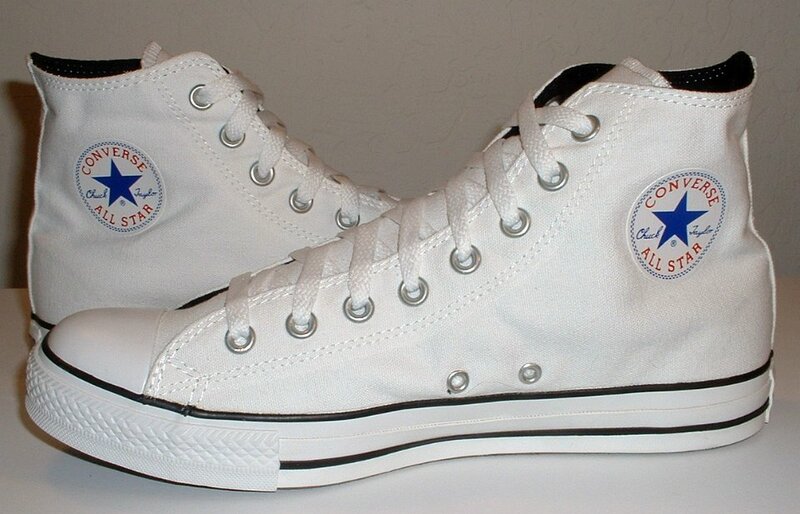 147 Optical White High Top Chucks Inside patch views of optical white and black rolldown high tops. 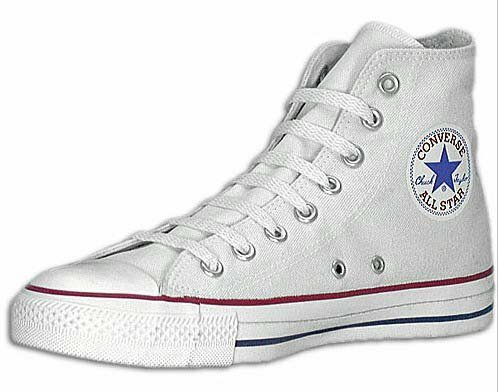 148 Optical White High Top Chucks Inside patch and sole views of optical white and black rolldown high tops. 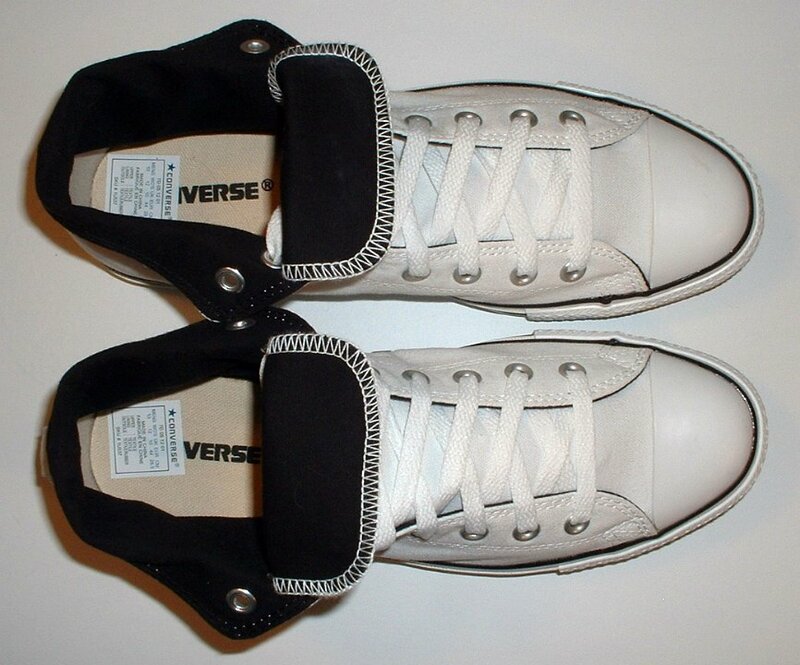 149 Optical White High Top Chucks Inside patch view of a right rolled down optical white and black high top. 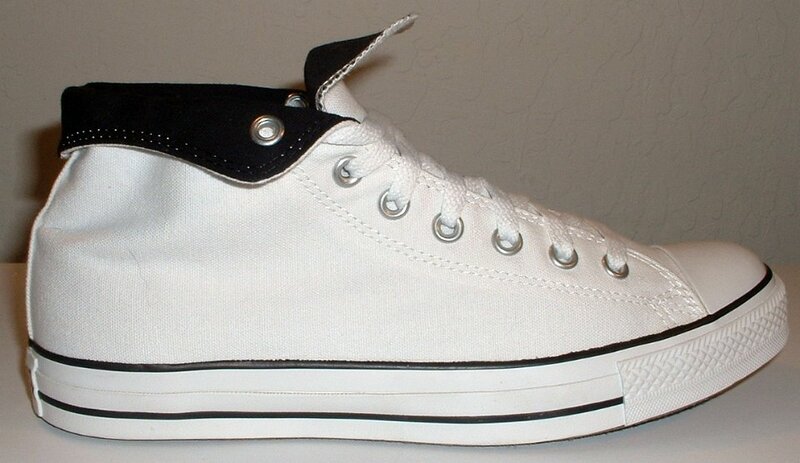 150 Optical White High Top Chucks Outside view of a right rolled down optical white and black high top. 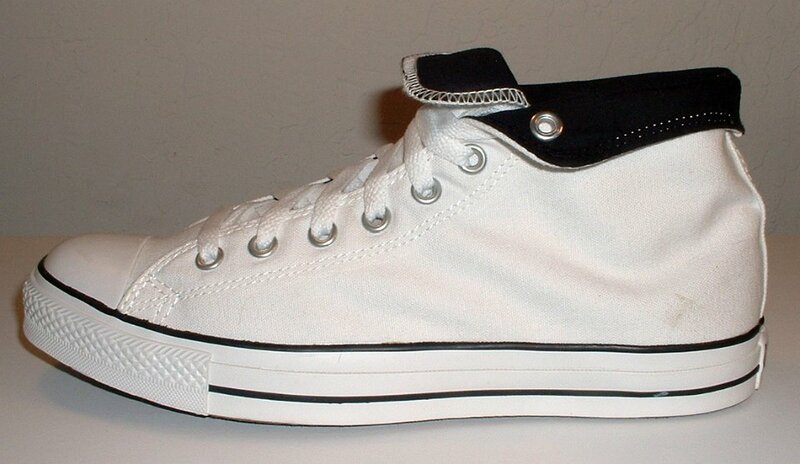 151 Optical White High Top Chucks Outside view of a left rolled down optical white and black high top. 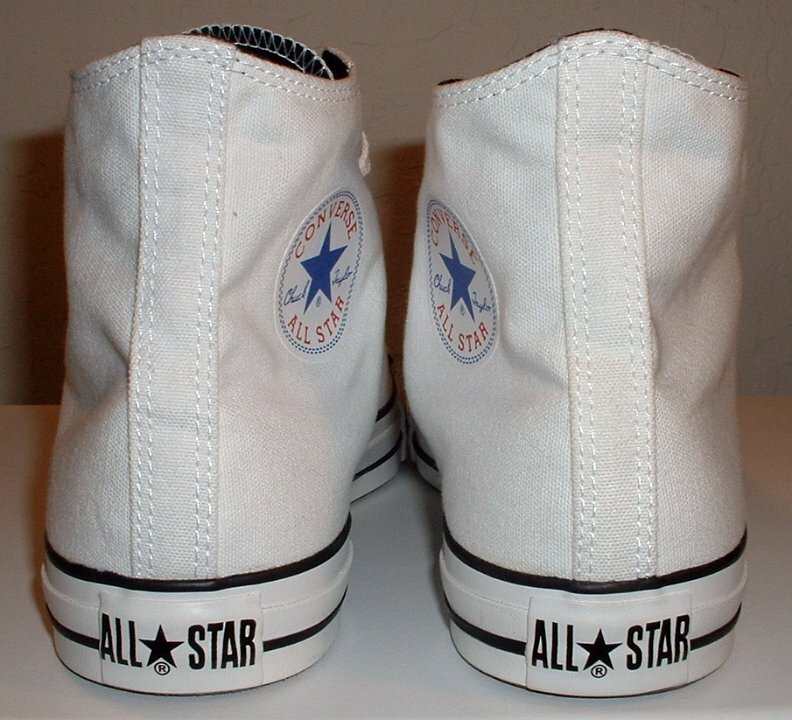 152 Optical White High Top Chucks Inside patch view of a left rolled down optical white and black high top. 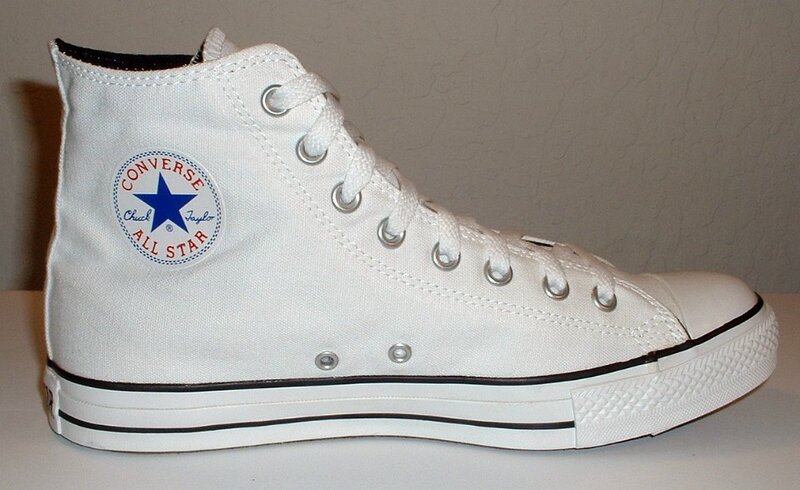 153 Optical White High Top Chucks Front view of rolled down optical white and black high tops. 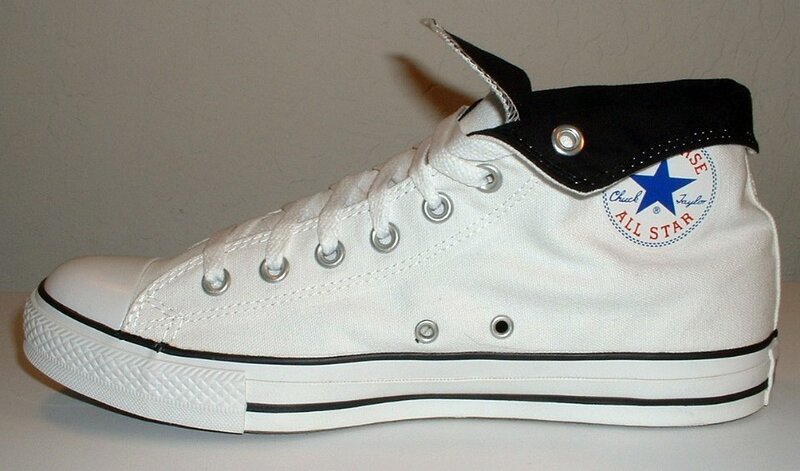 154 Optical White High Top Chucks Angled front view of rolled down optical white and black high tops. 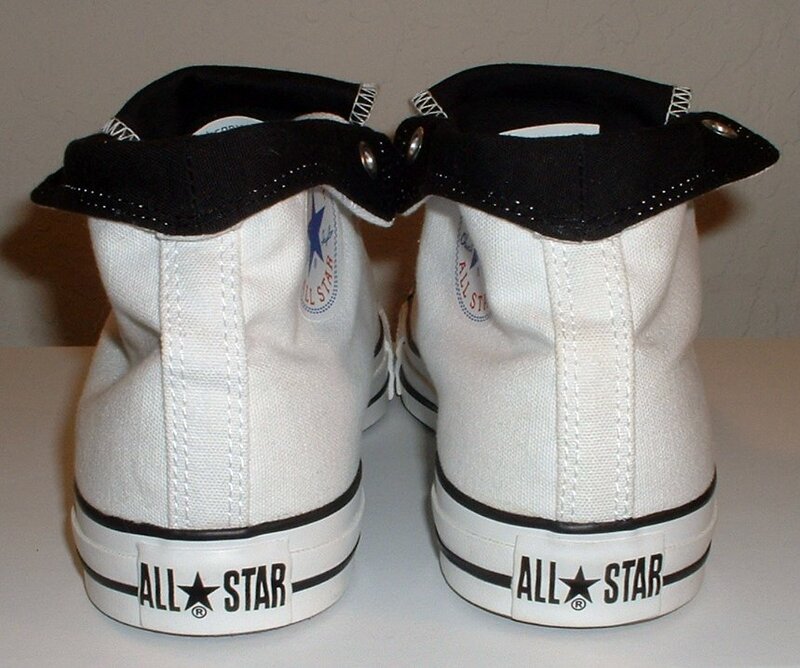 155 Optical White High Top Chucks Rear view of rolled down optical white and black high tops. 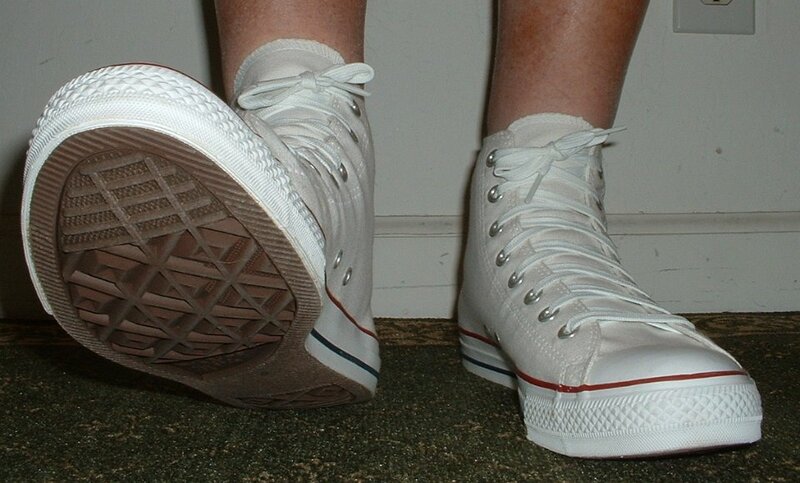 156 Optical White High Top Chucks Top view of rolled down optical white and black high tops. 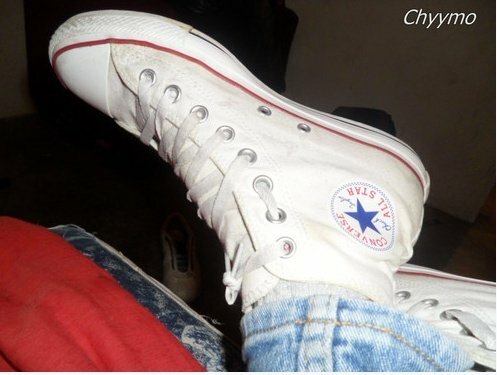 157 Optical White High Top Chucks Inside patch views of rolled down optical white and black high tops. 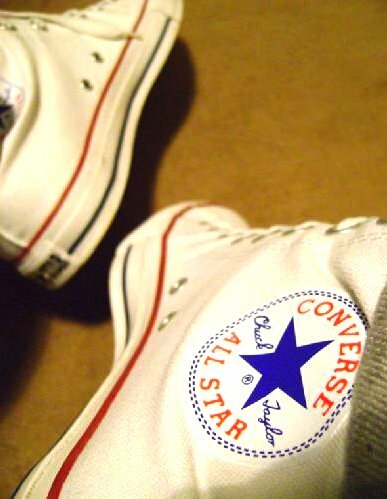 158 Optical White High Top Chucks Inside patch and sole views of rolled down optical white and black high tops. 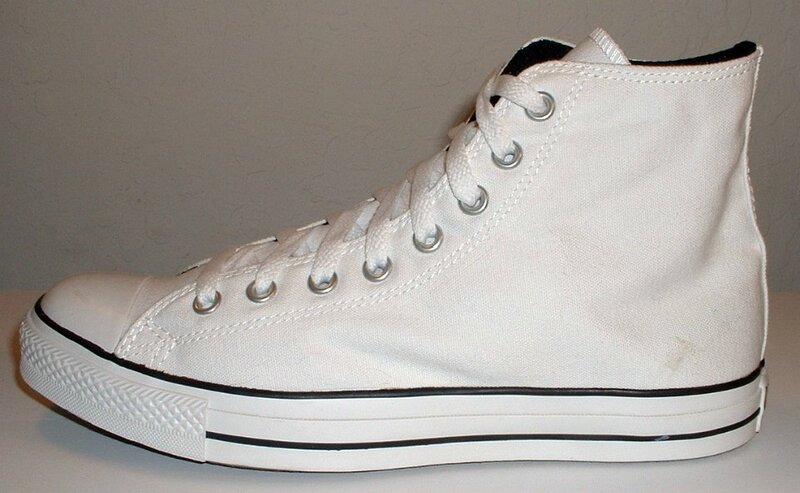 159 Optical White High Top Chucks Angled side view of rolled down optical white and black high tops. 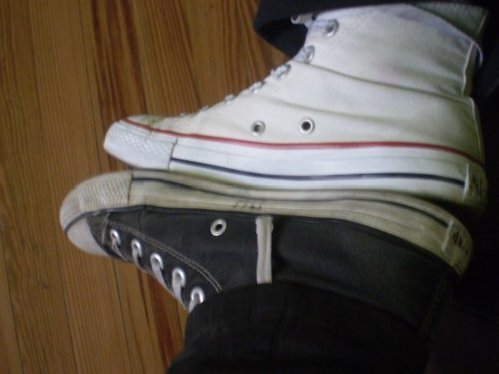 160 Optical White High Top Chucks Optical white high top contrasted with a black high top. 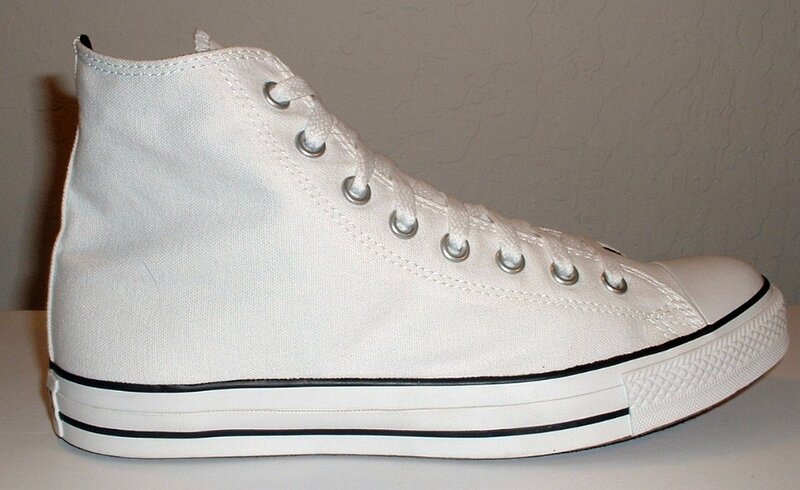 161 Optical White High Top Chucks Rear view of optical white high tops with zipper back. 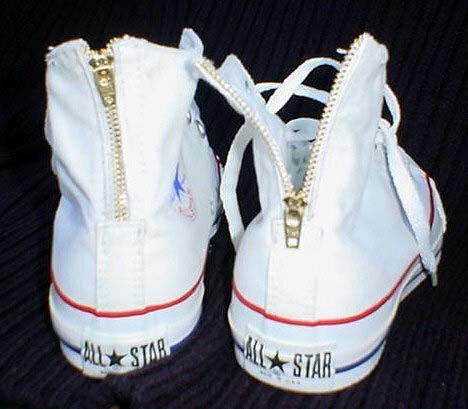 162 Optical White High Top Chucks Optical white high tops with zipper backs, front view. 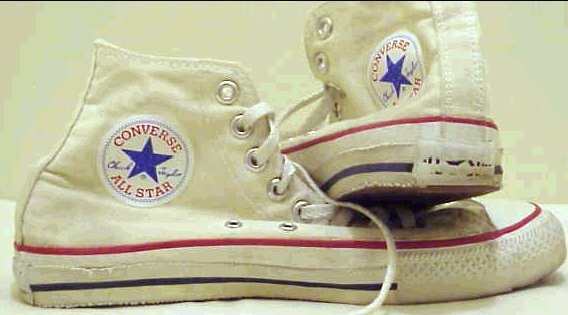 Converse makes two core white models of Chuck Taylor shoes: optical white, a bright white color, and natural or unbleached white, where the canvas is left in its natural color. Both core models have red and blue piping. 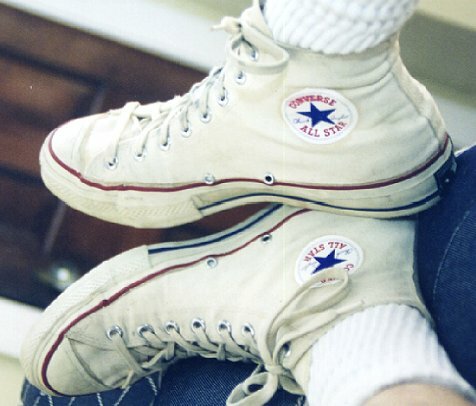 Throughout the years there have been many seasonal variations on the white high top and low cut models, but optical white and natural white still remain the most popular.